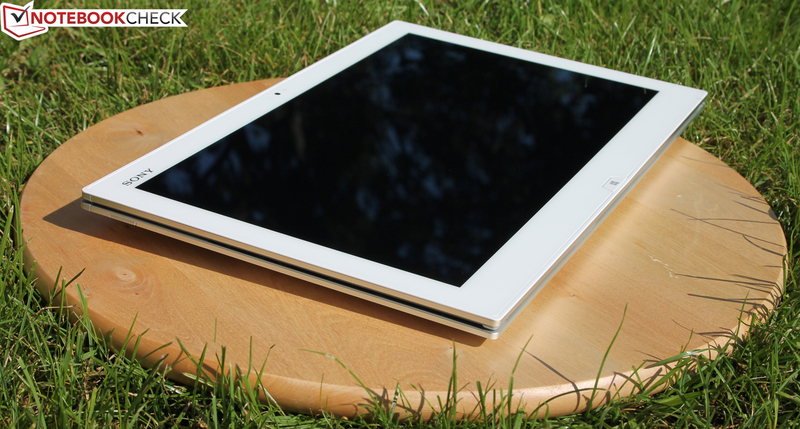 Not quite your ordinary tablet. 11 becomes 13. How large does a slider convertible have to become in order to allow its user to work comfortably with Windows? How sturdy is the hinge? 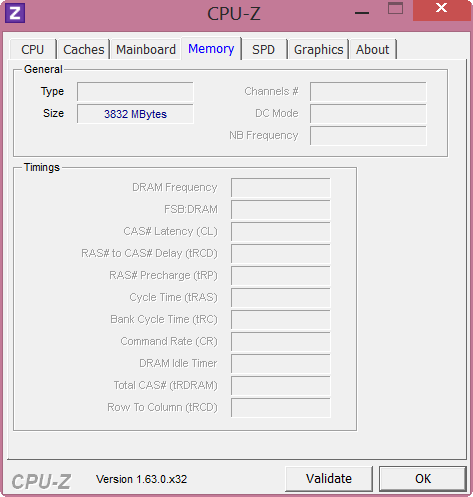 And what kind of performance levels can be expected from the Haswell ULV CPU? We've got the answers. 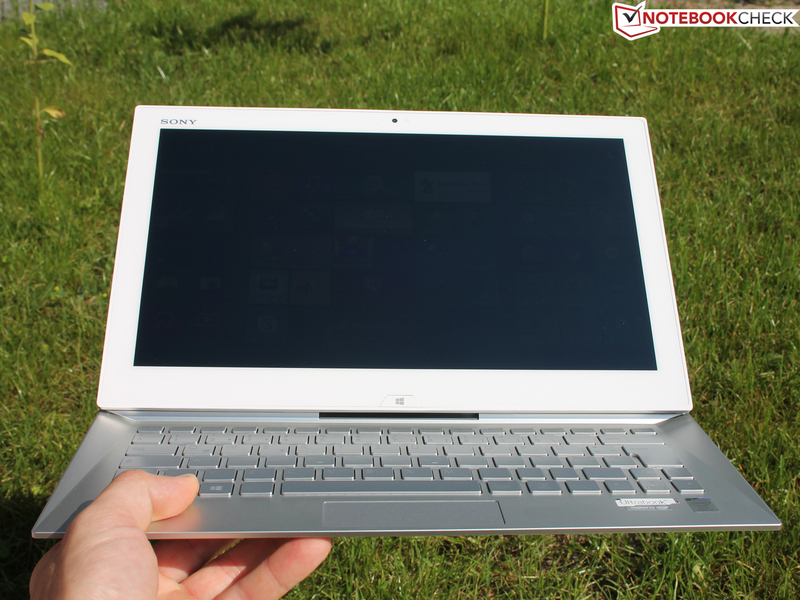 Sony Vaio Duo 13 SVD1321M2E: Typing, browsing, working - a workhorse among convertibles? 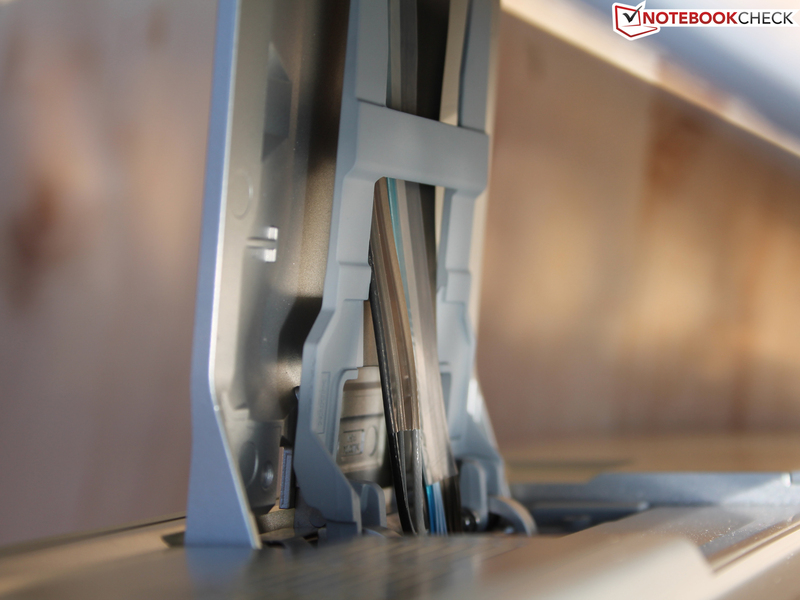 Manufacturers have been trying for more than a year now to release Windows convertibles which are as compact as possible, capable of reaching Ultrabook-like performance levels while still being controlled comfortably. 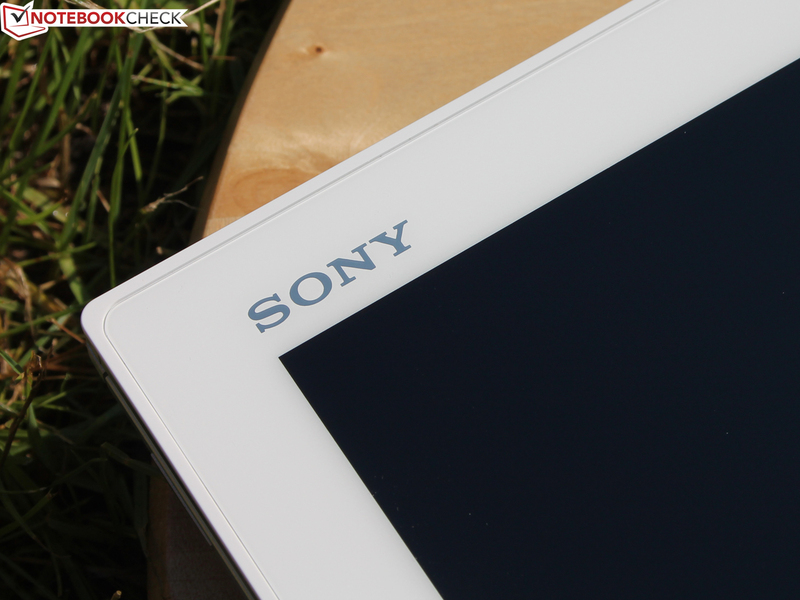 Sony's first iteration in this market of jacks of all trades has been the 11.6-inch Duo 11, a device which gathered favorable reviews despite its premium price point due to the fast innards (CPU, SSD) and a high-quality Full HD IPS panel. 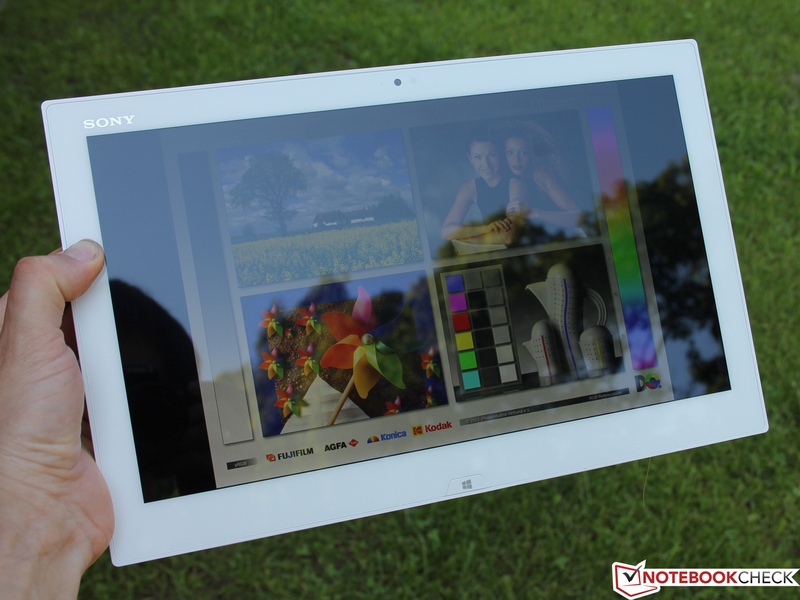 Now, Sony seems to think that the same Full HD panel in a 13.3-inch display might be even more useful. 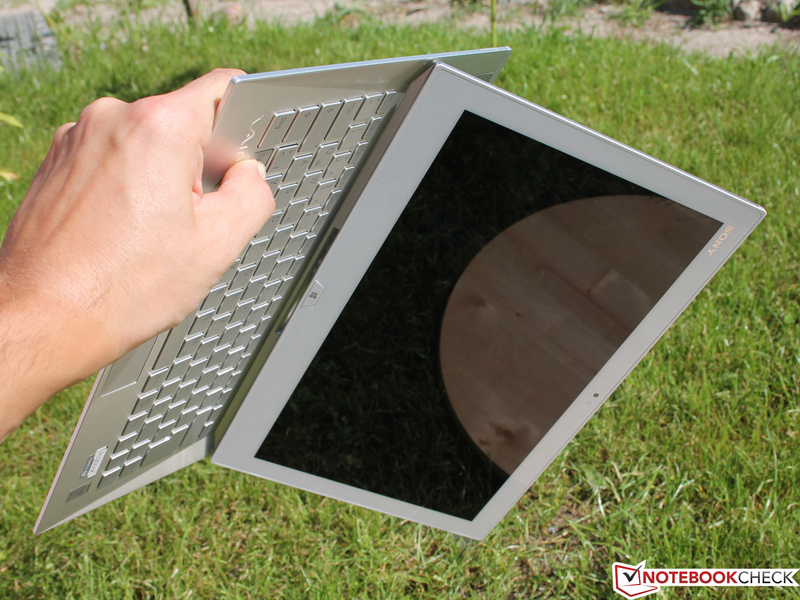 The underlying principle remains the same, although the hinge has been reduced in size: A simple pull on the display transforms the tablet into a subnotebook with an actual keyboard. Pushing it down again lets it return to tablet mode. So is there any innovation at all? We do actually think so. 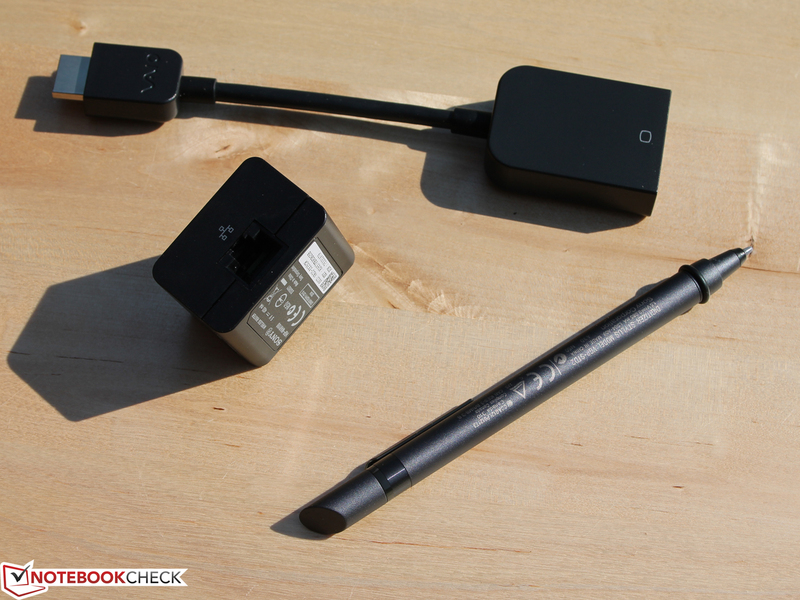 After all, the Duo 13 managed to garner a "very good" in our review. 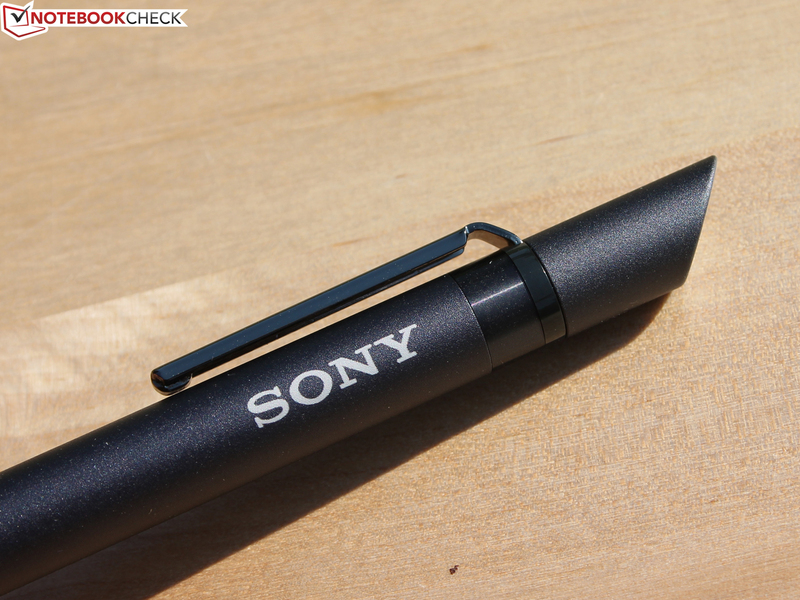 How Sony has managed to do that and whether a (SRP) price point of $1399 is justified will be revealed below. The Duo 13 can be had in a selection of colors, namely white, black and - only available in the Vaio Online Store - red (the extravagant RED Edition). Our test device comes in white, though. Both parts of the chassis are made from painted magnesium. The matte surfaces aren't quite as cool-feeling as they would have been with aluminum, but they are even lighter. 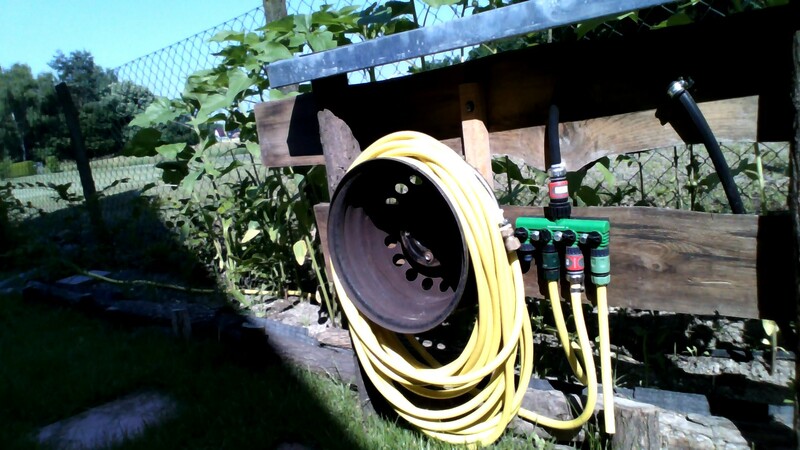 The base unit - within which all of the hardware components are hidden - is sufficiently torsion-resistant. Unfortunately, many parts of the case (especially concerning the lower front part of the base unit) can be bent, revealing some clearances. 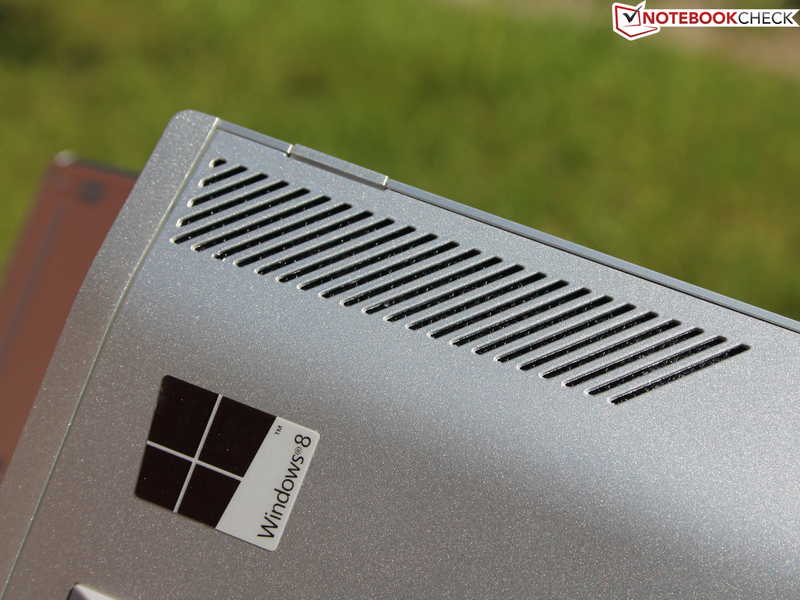 The rear part which houses the main components and all ports feels sturdier. 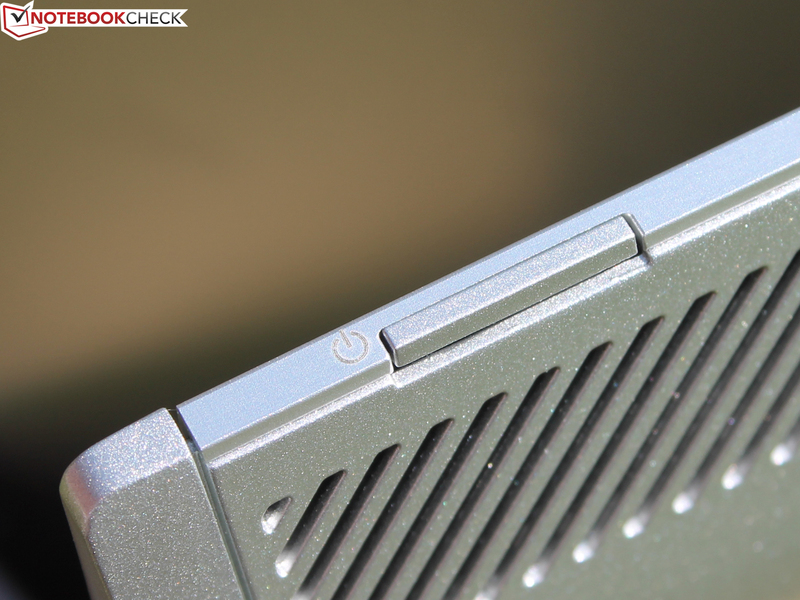 A small hinge (with the body being made from aluminum) connects the display and the base unit. 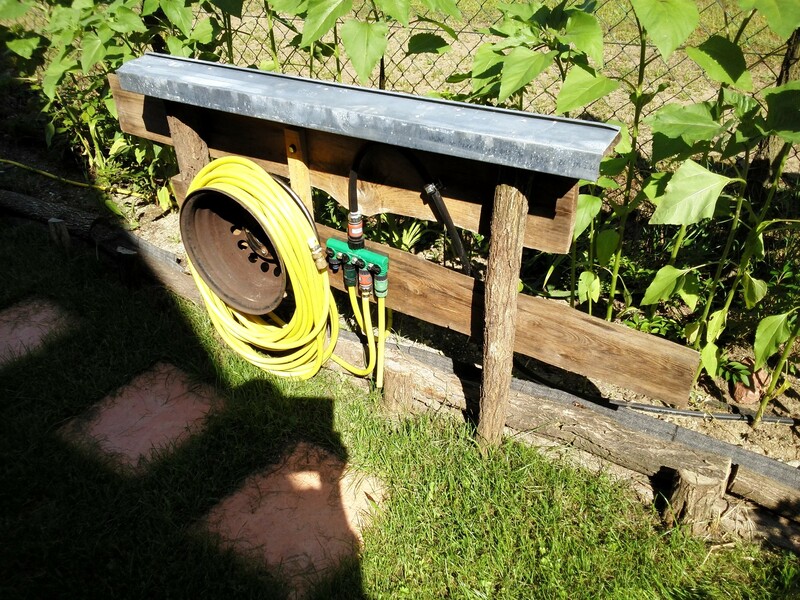 This has to withstand the bulk of all forces, being pushed by two spiral springs into position, while a smaller auxiliary arm keeps everything in place. Since it is too weak to keep the display in a horizontal position, no "table mode" (where the display is parallel to the base unit) is possible. 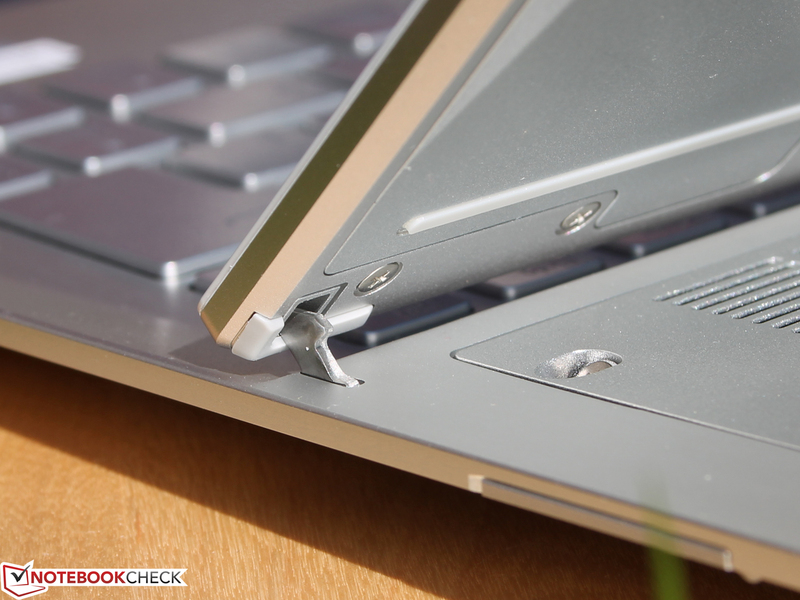 In laptop mode, two small hooks lock into place, leading to a stable connection which even remains in place when holding the device upside down. 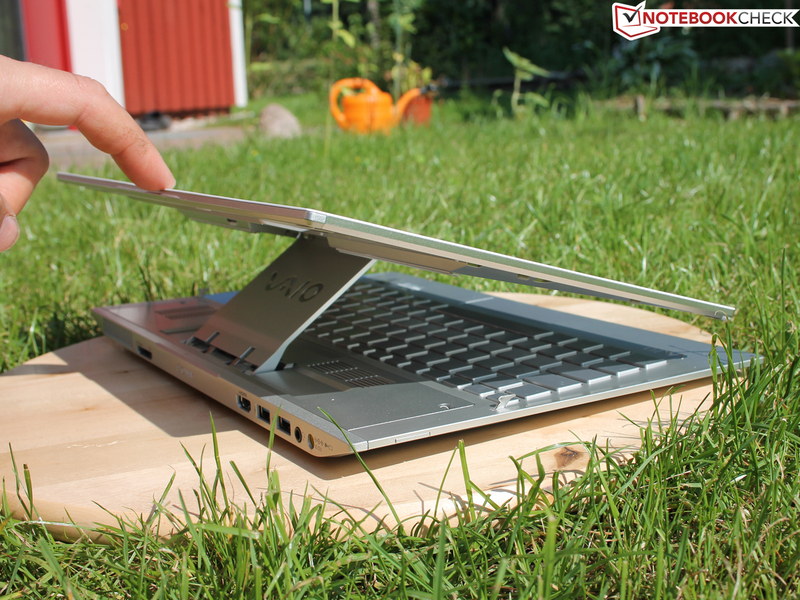 Thus, the Duo 13 can be carried around in laptop mode without falling apart if some care is taken. 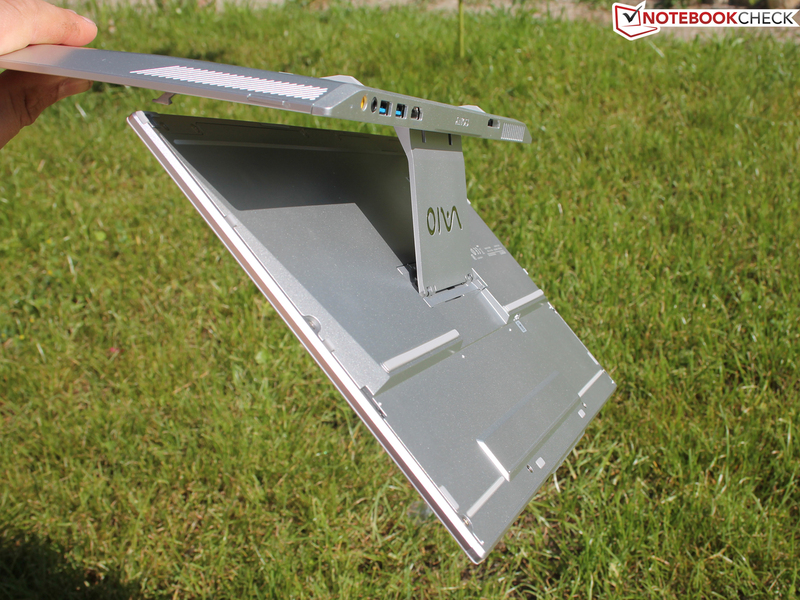 The same metal hooks are essential when the Duo 13 is being used in tablet mode, locking onto the notches, firmly connecting the base unit with the lid. Still, next to the Windows button the entire construction can easily be forced open (by approx. 4 cm). After all, the Duo 13 is no rugged convertible for construction sites. Careful handling is important. How does the small hinge keep the display in place? The massive connection piece is made from magnesium. Behind it the lead hinge can be found which predetermines the end position. We were quite fond of the multitude of ports on the rear end of the Duo 11. 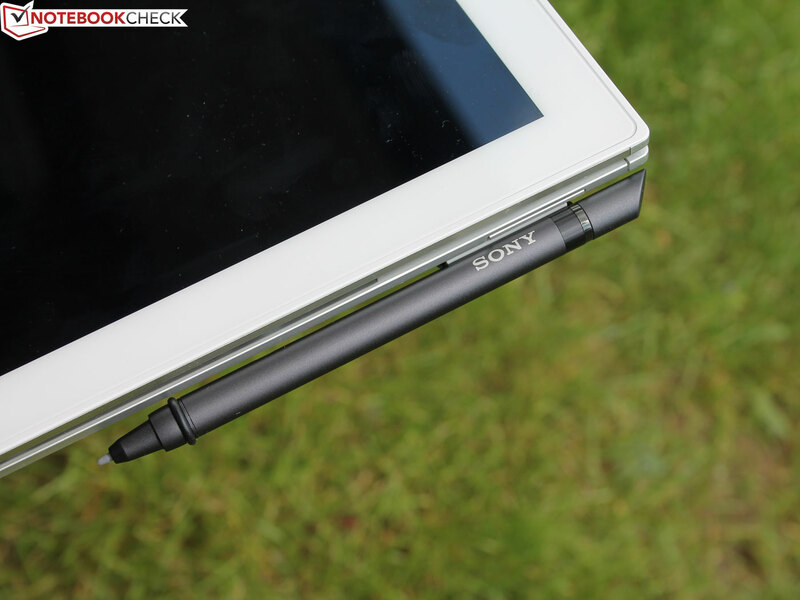 Sony follows a similar design language with the Duo 13, even though the available space could have been used better. There are only two USB 3.0 ports which are also located too close to each other. A thick connector (such as the USB to eSATA converter which we used) blocks e.g. the mouse port. Even HDMI to DVI adapters are too thick. 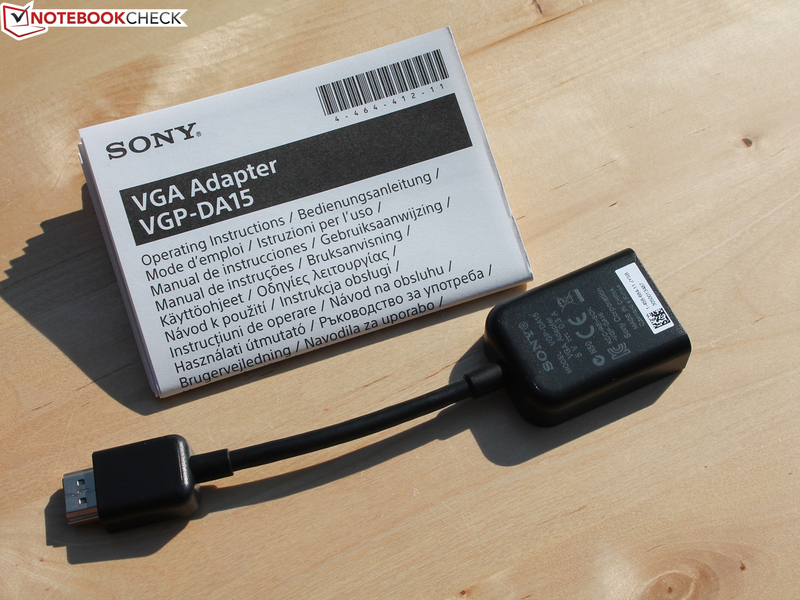 VGA is only available via an included HDMI to VGA adapter. 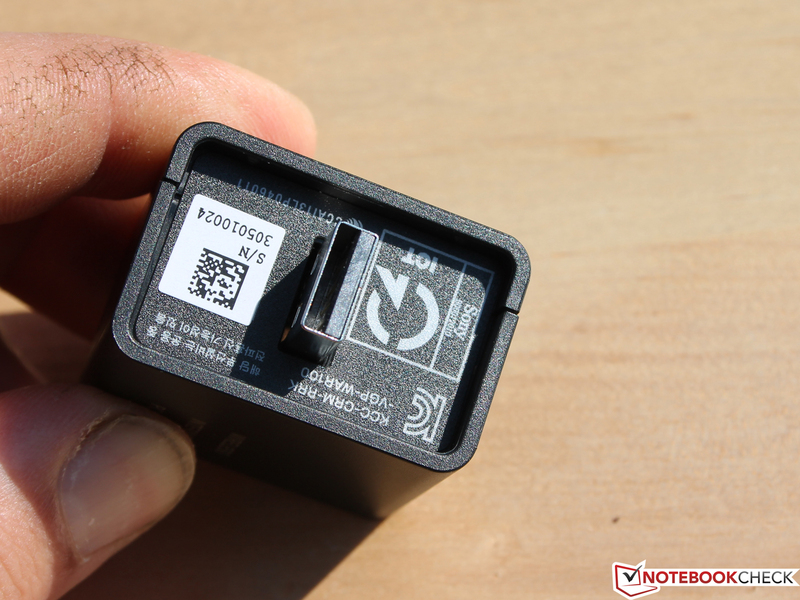 The convertible also comes with an unusual Ethernet port via the power connector (more details can be found in the "Communication" section and below the images on the right hand side). 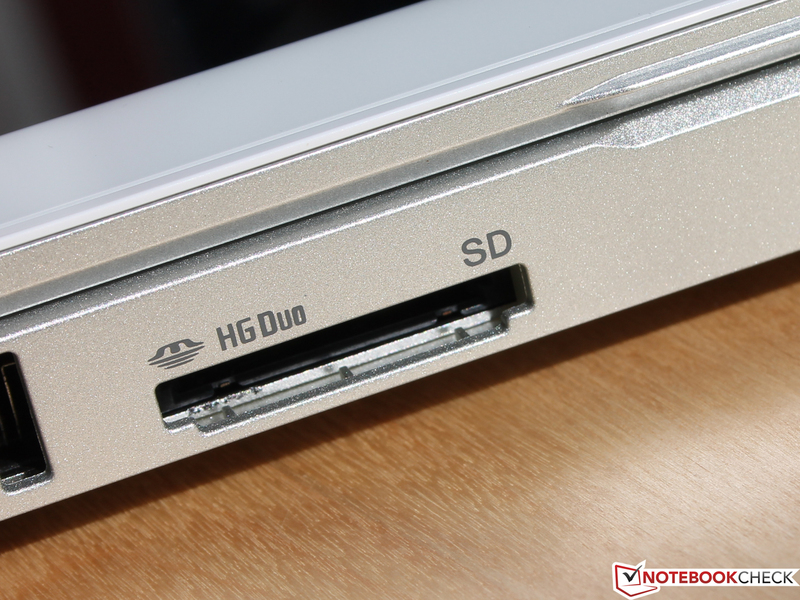 There are no ports at the flattened sides, but the convertible does sport a card reader (SD and Memory Stick HG-Duo). We are not impressed by the short range (approx. ten meters) of the Broadcom 802.11 a/b/g/n Wi-Fi adapter. 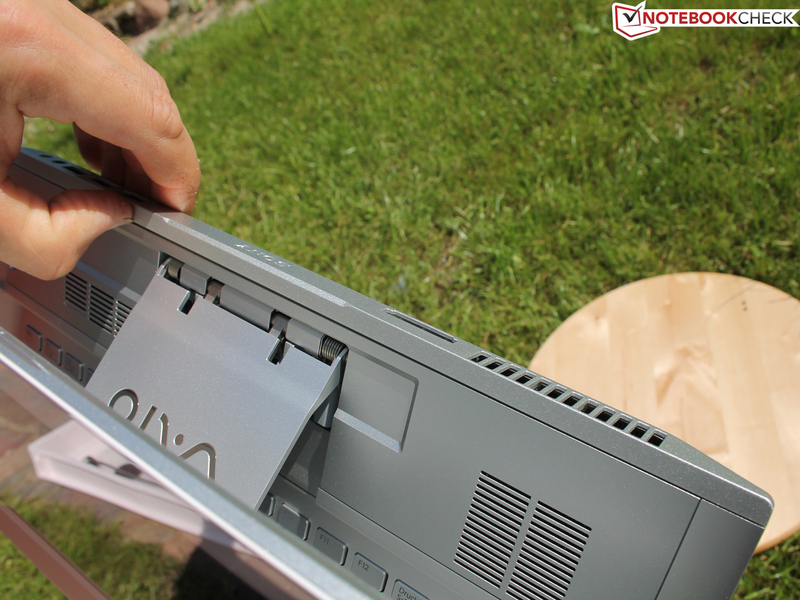 Other laptops sport a maximum range of around 40 meters under similar test conditions (both inside and outside of the house). 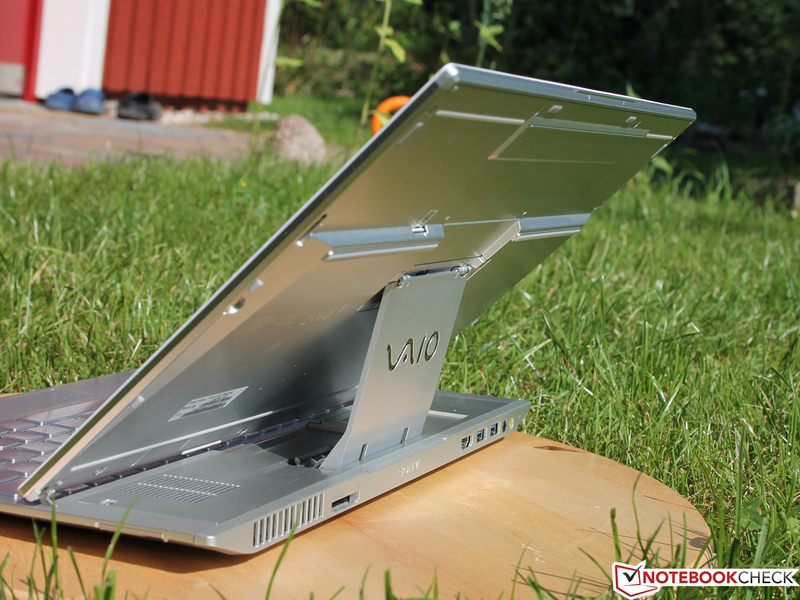 Actually, the Vaio Duo 13 is the first test device which falls short of our minimum stable connection range of 15 meters. Even three meters away from the router (and with an unobstructed line of sight), only four out of five bars are shown. 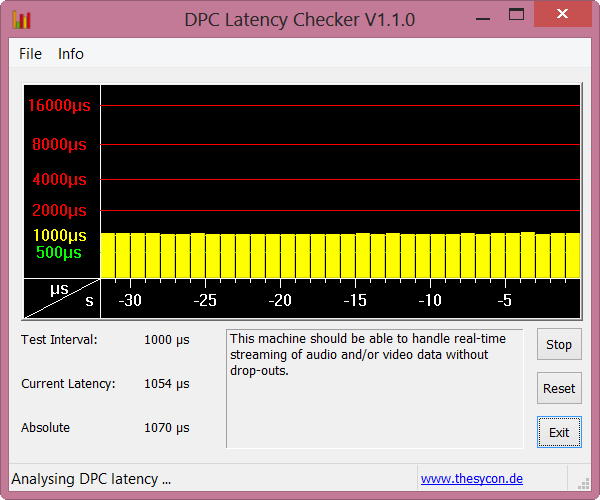 On the upper floor ten meters away, this goes down to just one bar - faring worse than any other laptop before it. A fast mobile internet connection is almost a must in this price segment. 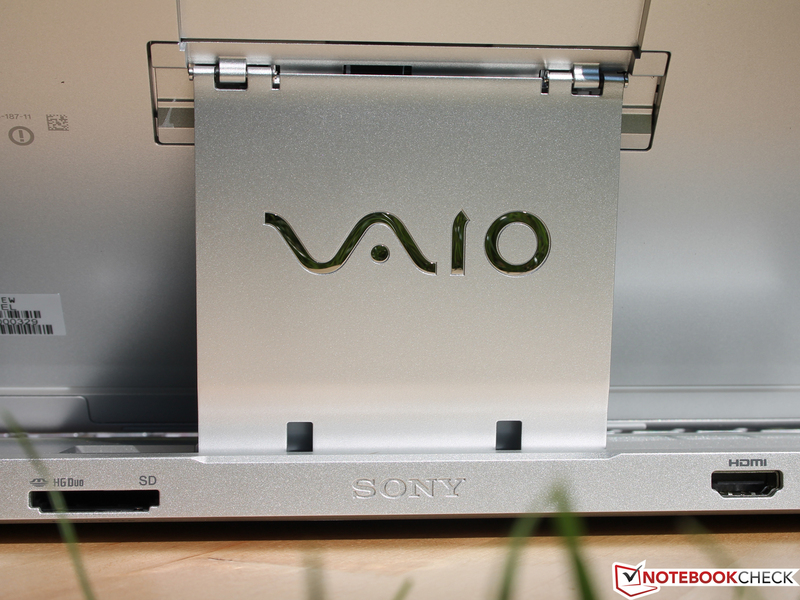 Thus, Sony ships the Vaio Duo 13 with a Huawei-made 3G modem which comes with an improved positioning service (GNSS) while being connected internally via USB. A Vodafone Starter Pack SIM card is already pre-configured (seven days for free, with up to 1 GB of data volume), being installed in the SIM slot on the rear side of the display. For an extra fee of around $40, an LTE/4G variant (HSUPA, UMTS, EDGE, GPRS) can be had instead. In theory, this is capable of increasing download speeds fivefold and upload speeds tenfold (3G vs. 4G: 21 Mb/s / 5.76 Mb/s and 100 Mb/s / 50 Mb/s). 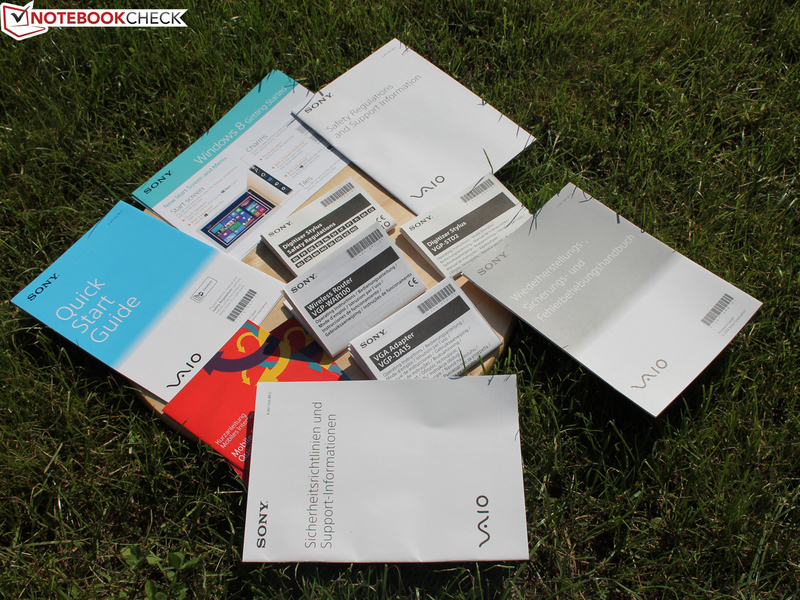 All tools concerning the device are bundled in the Vaio Care center. Here, hardware settings can be changed (e.g. 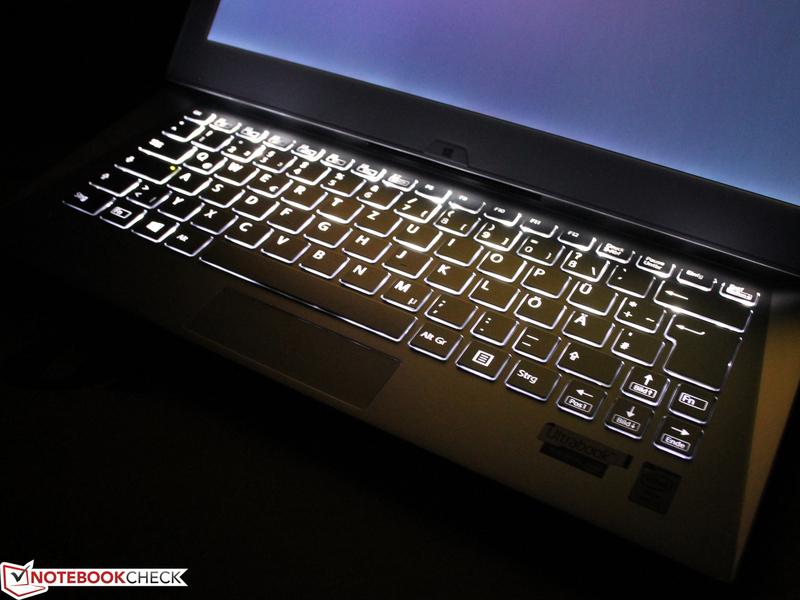 the backlighting can be activated at all times), the service center can be contacted, a condition test can be performed (checking the device for errors, availability of updates or security issues), the recovery tools as well as all premium business tools (optionally available for a fee) can be accessed. 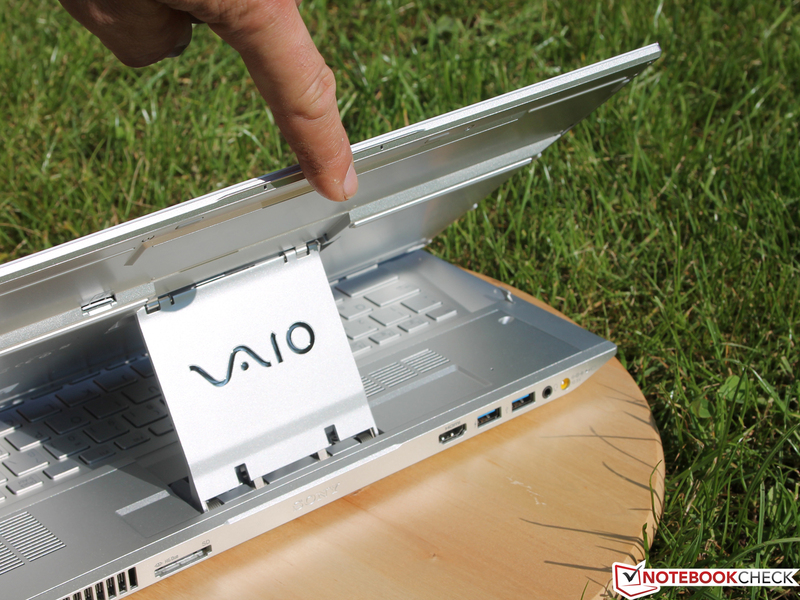 A great idea: There is a transfer support tool which helps the user to move his or her data and settings to a new Vaio device. Our test device came with a trial version of McAfee Security. In the online shop, it is possible to buy one-, two- or three-year licenses for Internet Security or Total Protection (McAfee). The same holds true for Adobe Lightroom, Adobe Creation and Microsoft Office. The Duo 13 ships with a wireless router, but again, its range is modest. Three meters away, we measure five bars, a number which goes down to one or two when ten meters and another floor are in between. Outside of the house, 15 meters away, one bar is reached. 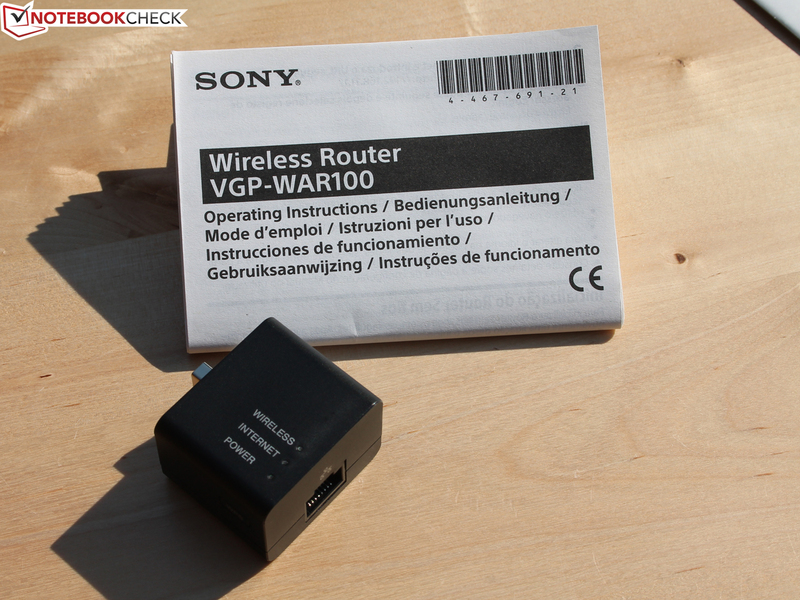 According to Sony, the line-of-sight range of the router lies at ten meters while up to five devices can be connected to it. These results are marginally better since the Vaio wireless router transmits at 100% of its peak power (with our Fritz!Box running at 50%). 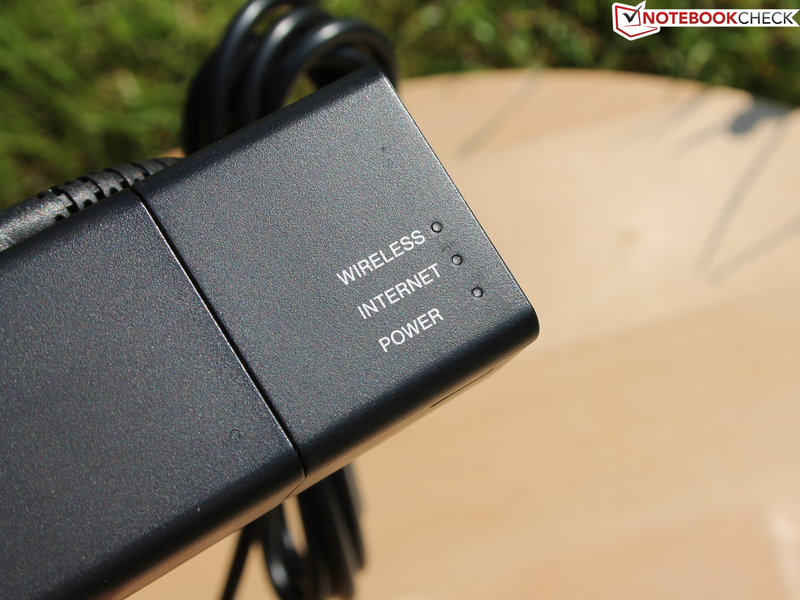 The router does not sport any external antennas, being connected to the power adapter. 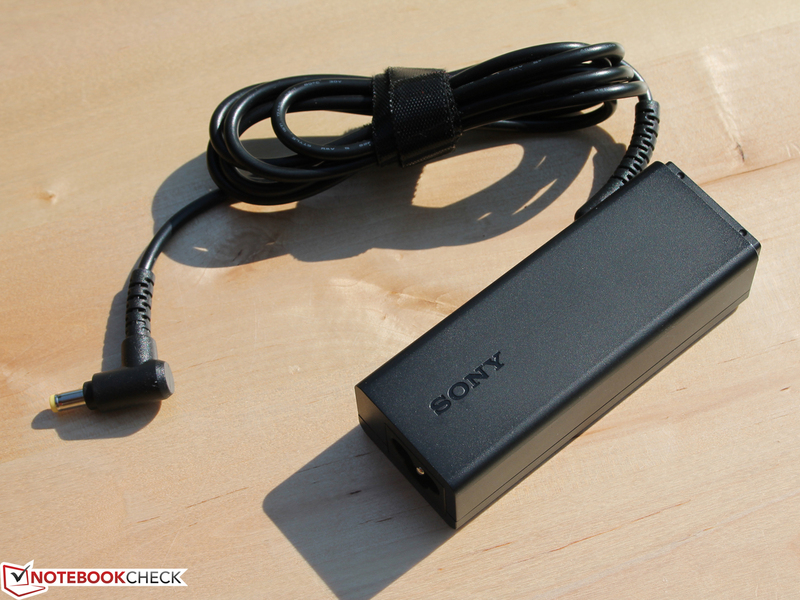 This is extremely handy as it doesn't need its own power cable and can never be forgotten. The Duo 13 also ships with numerous manuals, a VGA dongle and capacitive digitizer pen (as well as a small pen holder which can be clipped to the right hand side of the chassis), an abundance of accessories which seems fitting given the price of the Duo 13. All quiet on this front. There is neither a maintenance hatch on the bottom panel nor visible screws which might be loosened to open the base unit. 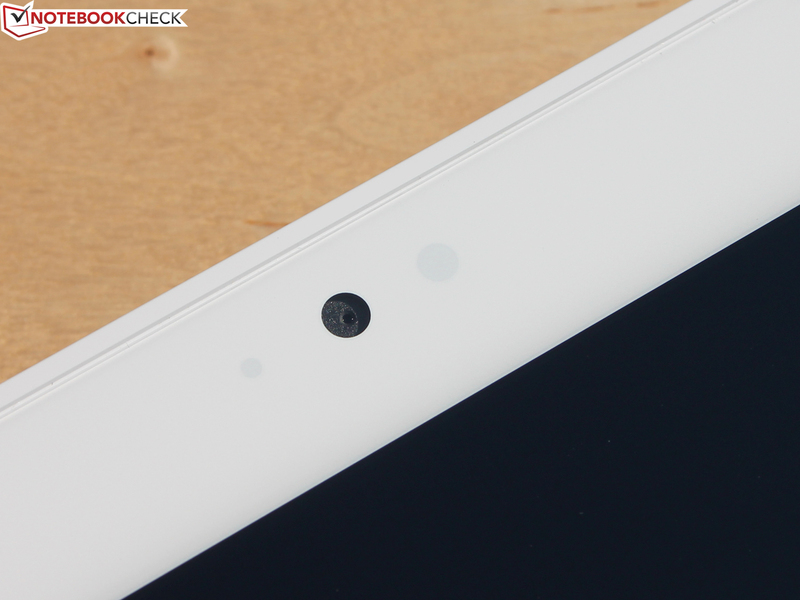 The plastic panel around the ports on the rear could possibly be forced off without causing any damage, but we refrained from doing so in order to keep our test device in one piece. 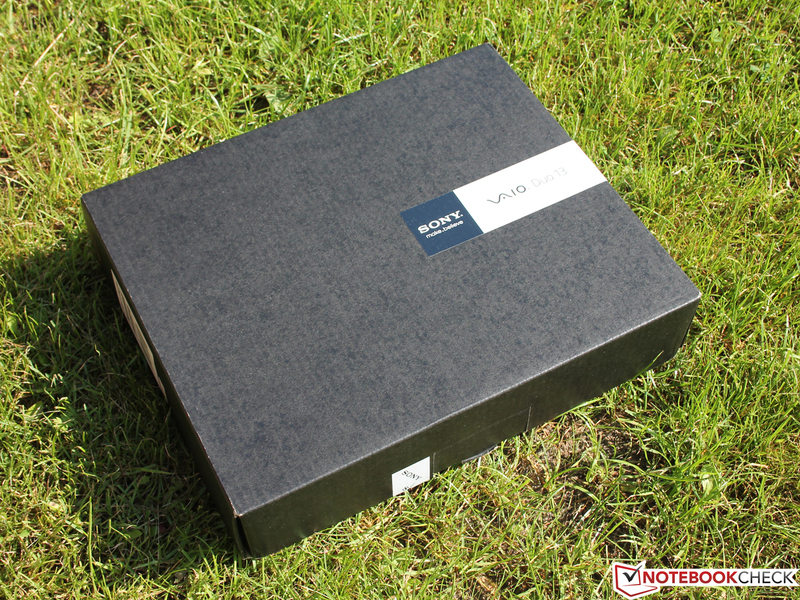 12 months of warranty when bought at reselling websites (for around $1400)? Not much for such a pricy device. Sony's online store offers two years of warranty, but optional upgrades such as 36 months for an extra fee of around $90 are also possible. This includes a pickup-and-return service (with a five-day return window) and immediate telephone support. The accessories with which the Duo 13 ships. 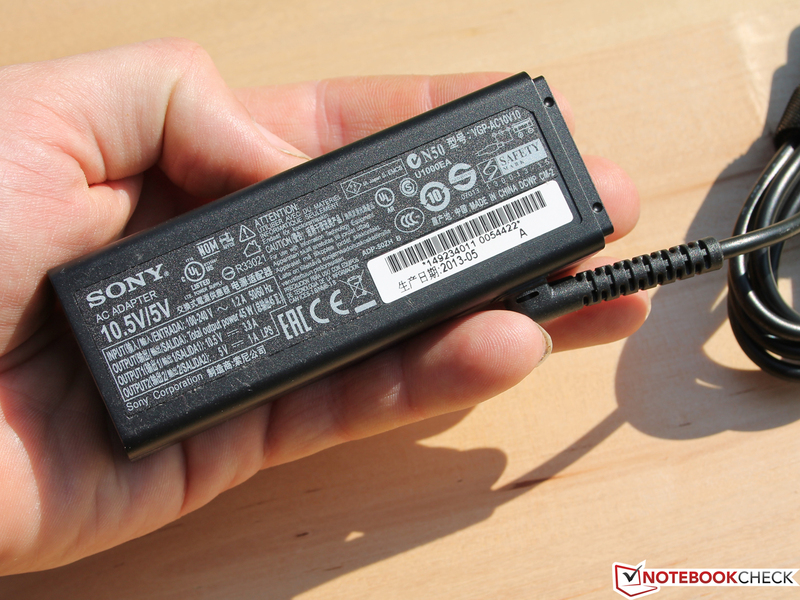 The power adapter (40 watts). Not bad at all: The rear camera sports 8 megapixels - and it yields superbly sharp, natural images which don't even get mushy when zooming in. Of course, it doesn't get as good as any entry-level DSLR as can be seen when comparing the last two images in full resolution. But it is far superior when compared to the front camera (2 megapixels): Mushiness takes the place of sharpness here. Unfortunately, even the better of the two camera modules doesn't really work well when trying to take videos. Despite its image stabilizer, the recording felt jiggly. It didn't help that the camera shifted its focus point constantly - something which even happened in manual mode (where the software simply didn't offer any buttons for sharpness and focus control). The keyboard is amply-sized with a lot of empty space between all keys. 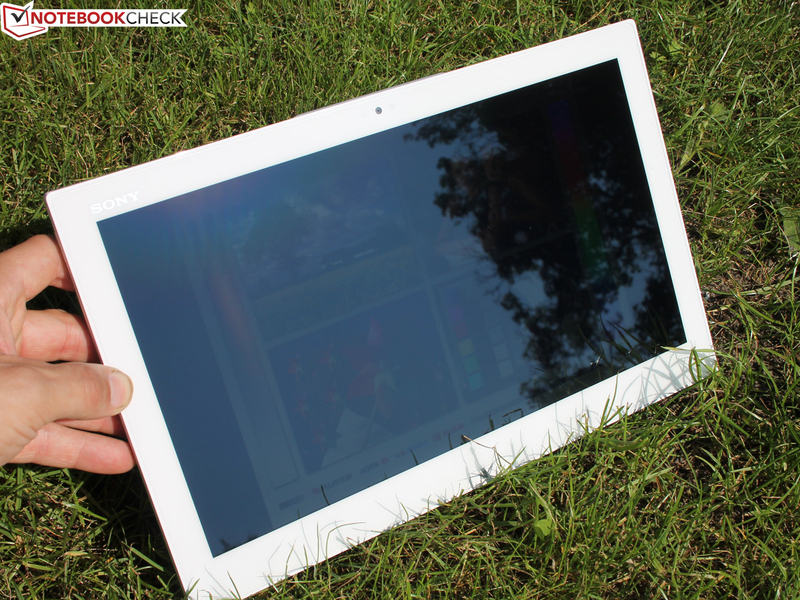 It also sports a number of useful laptop controls, such as those regulating the display brightness. While we weren't satisfied by the short travel, keystrokes felt firm. Still, writers will not be happy about the unsatisfying feedback due to the little movement of the keys. The layout is fine, with the only exception being the right shift key (which we managed to press frequently without meaning to). 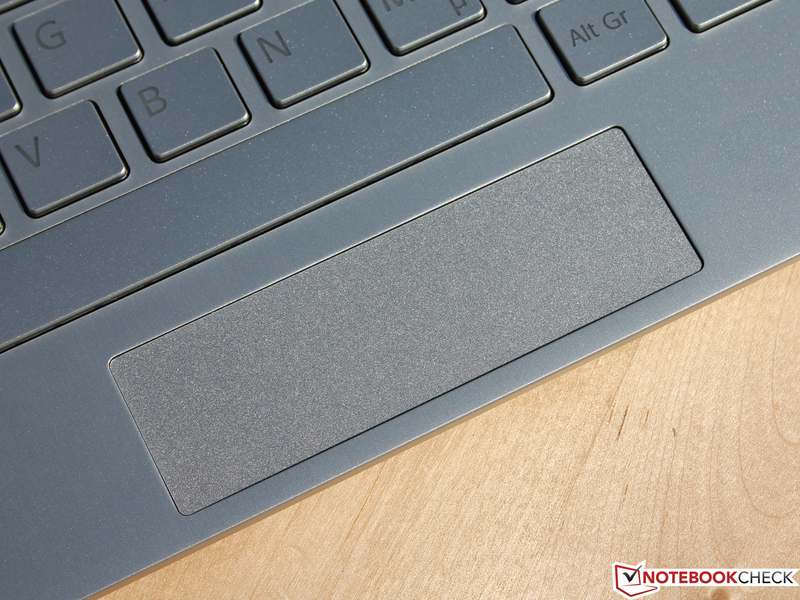 The tiny touchpad - replacing the trackpoint of the Duo 11 built into the keyboard - measures 8.0 x 2.5 centimeters, sporting a diagonal of just 8.3 centimeters. 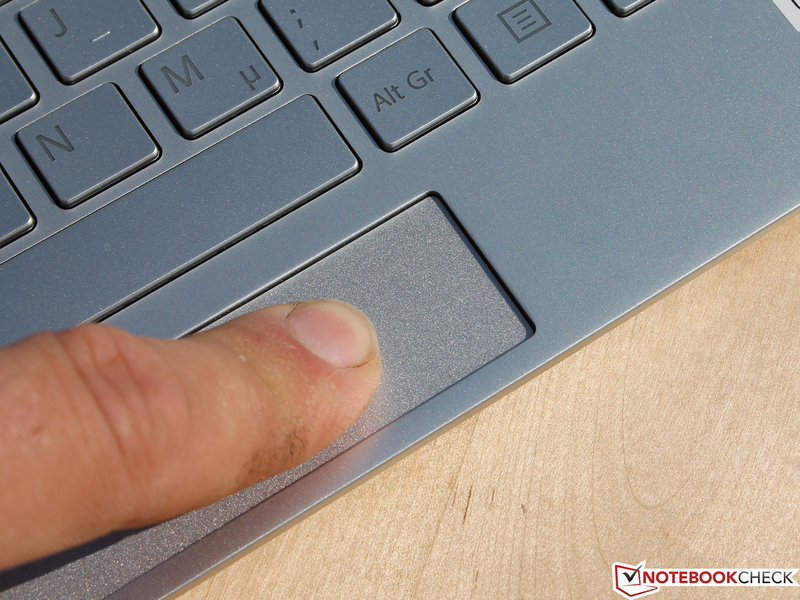 There are no separate mouse buttons, just one clickpad which is capable of interpreting any click as a left mouse click or a right mouse click depending on the position of the user's finger. 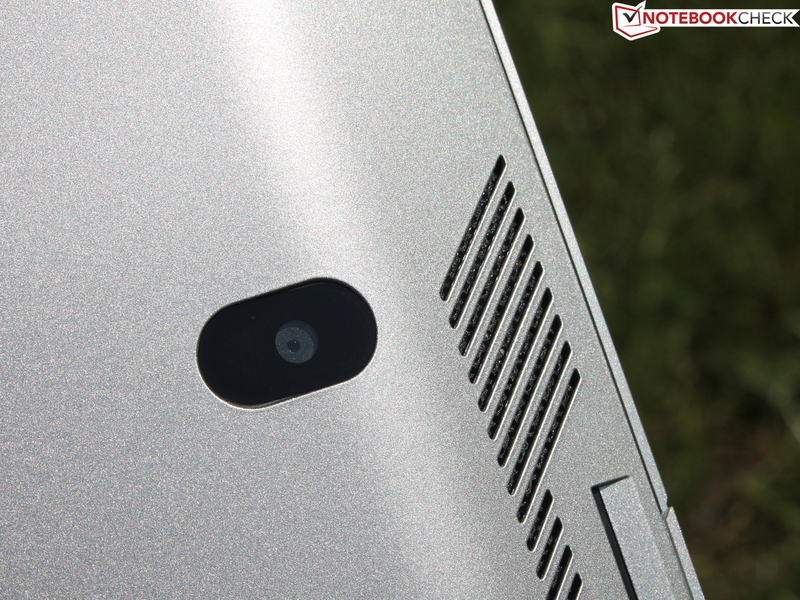 The smooth yet fingerprint-proof, silverish surface makes it gliding-friendly. Unfortunately, it is not much fun to use. Due to the small surface area, it takes quite long to actually cross the entire desktop (of course, the sensitivity can be boosted at the expense of precision). The Full HD display shows no lags and doesn't require any further calibrations. We were surprised how precisely it registered our fingers. Even small buttons and menu items could be hit despite of the high display resolution. Since the hinge is attached to the center part of the screen, the display didn't give in even when pressing strongly. The downside: It is not possible to change the display angle, something which other convertibles or subnotebooks with touch functionality do offer. 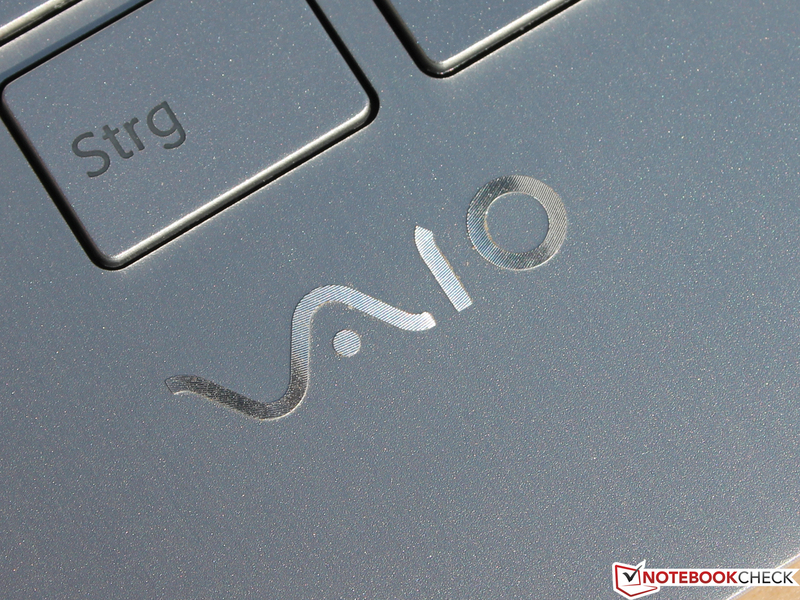 The sturdy, fixed laptop mode is a unique feature of the Vaio Duo 11 and the Vaio Duo 13. 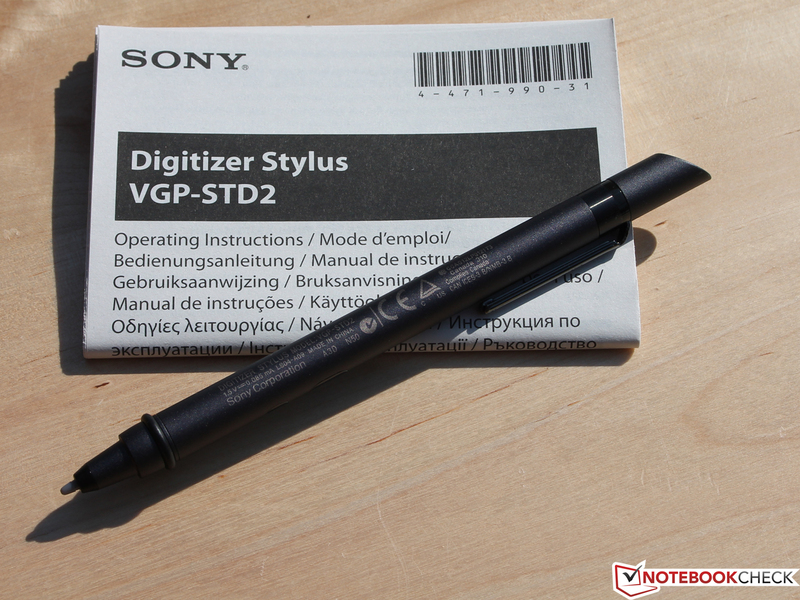 When trying to do some actual work in desktop mode, the stylus pen with its capacitive digitizer (which comes with its own battery as it has to be conductive like human skin and unlike ordinary, resistive pens) becomes indispensable, especially in tiny menus and while drawing or (hand)writing. 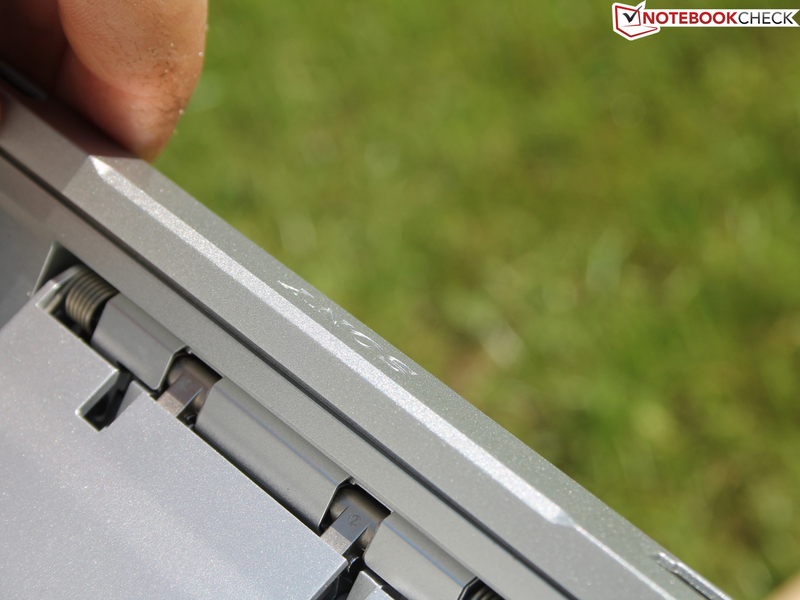 In laptop mode, the pen can be stowed away in a pull-out retainer; otherwise a plastic holder can be clipped to the right side of the chassis. Overall, we are quite content with the selection of input methods, even though the keyboard would profit immensely from longer key travel. 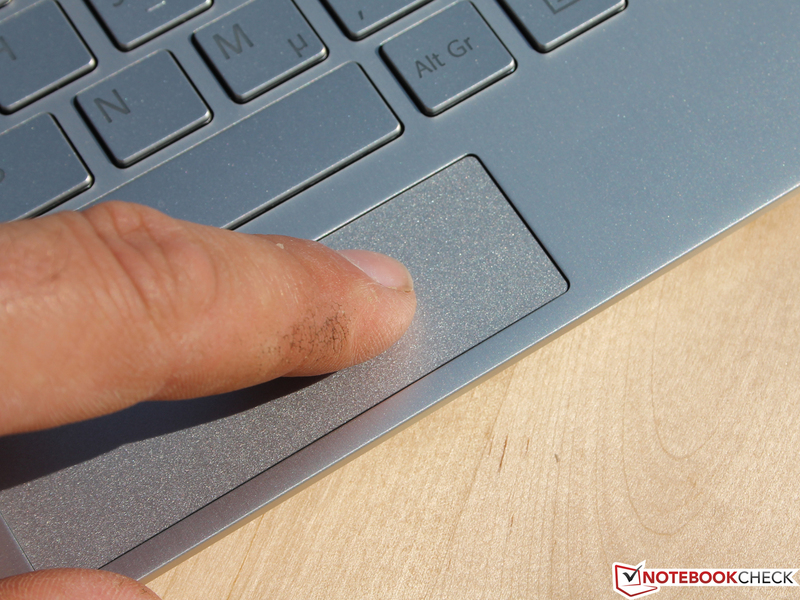 Those who work with the digitizer a lot will barely use the touchpad anyway, but still, a trackpoint (such as on the Duo 11) integrated into the keyboard would probably have been the better choice for some users. The reflective Panasonic IPS panel (type MEI96A2) sports Full HD resolution of 1920x1080 pixels. This is very decent for a 13-inch device and just about right for working productively. This is the only panel choice for the Duo 13, but Sony does offer an anti-glare protective foil (for around $40) which is supposed to reduce reflections while also protecting the display against scratches and dirt. Both a contrast ratio of 1151:1 and black levels of 0.32 cd/m² are great. 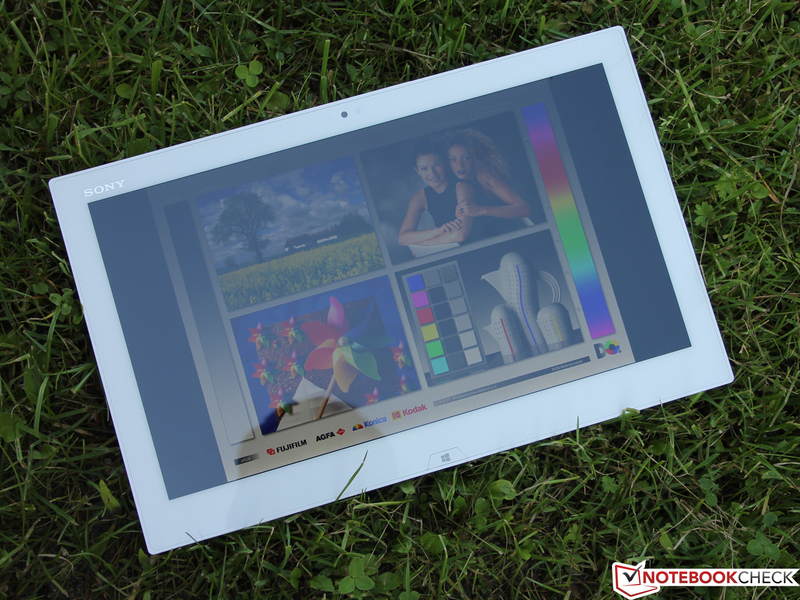 The so-called OptiContrast screen yields vivid colors, turning photos, games, movies and even documents into an eye-popping experience. 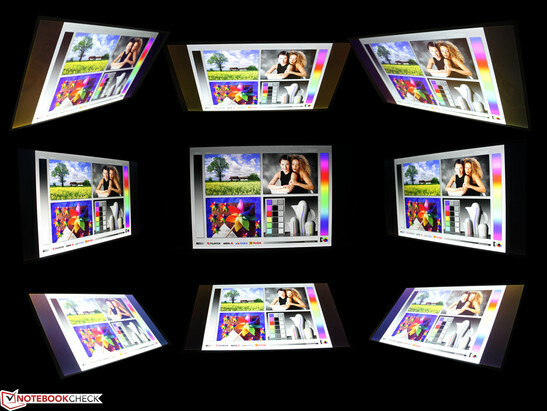 The Triluminos display also comes with a high brightness of around 362 cd/m² on average (and up to 399 cd/m²). We have deactivated the ambient brightness sensor during our tests in order to keep it from influencing our measurements. Usually though, this keeps the display brightness in balance with its surroundings. 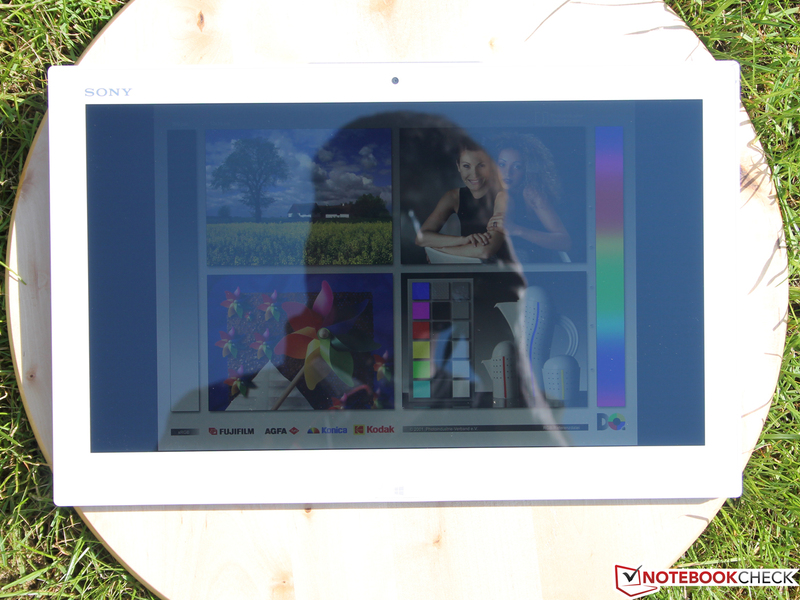 According to Sony, the Triluminos display is capable of yielding a "large color spectrum" and "revolutionary vivid and natural colors in all modes". We have calibrated the panel with respect to sRGB, checking the coverage of the two most important color spaces. It is capable of covering 93% of the sRGB color space and 64% of the AdobeRGB color space. The CalMAN software and a photo spectrometer are used (prior to calibration, in its delivery condition) in order to test how close the panel gets to fulfilling the needs of graphics artists. Grayscale rendition is pretty good with a DeltaE (2000) of less than 4, meaning that according to the color maps there is no discernible difference between the sRGB pattern and that of this display for the human eye. After calibration (Vaio Care: color temperature deactivated), the DeltaE (2000) value goes down to less than 2.5, with an ever so slightly warmer white point. A barely measureable blue tint can be seen when looking at the color saturation. After calibration, this decreases, with a decent maximum deviation of approximately 3 (average DeltaE value in ColorChecker) instead of 4 for magenta, blue and green hues. Thus, the Sony Triluminos display is pretty great at rendering precise colors and grayscales, even prior to calibration. While not perfect, the 93% coverage of sRGB space should be sufficient even for most professional users. Despite great brightness levels of up to 400 cd/m² and a high contrast ratio, the display is hard to read in direct sunlight due to its annoyingly strong reflections. Still, the subjective results (with the desktop still being well-recognizable) are far ahead of most glare type displays in lower-contrast laptops. The ambient light sensor is deactivated. 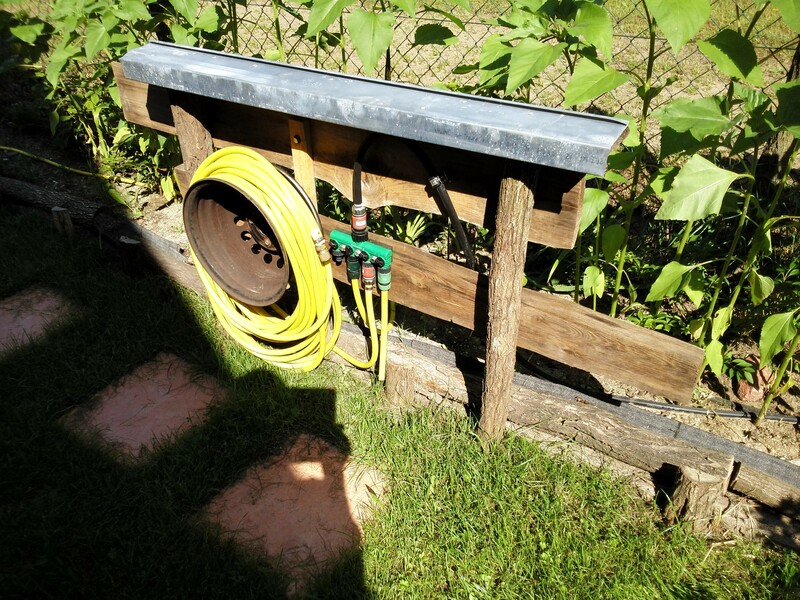 Maximum brightness (in the shade). Great viewing angles are crucial to working while on the road. In this regard, the Duo 13 is perfect. The image remains sharp and bright with no color distortions even at extreme angles. 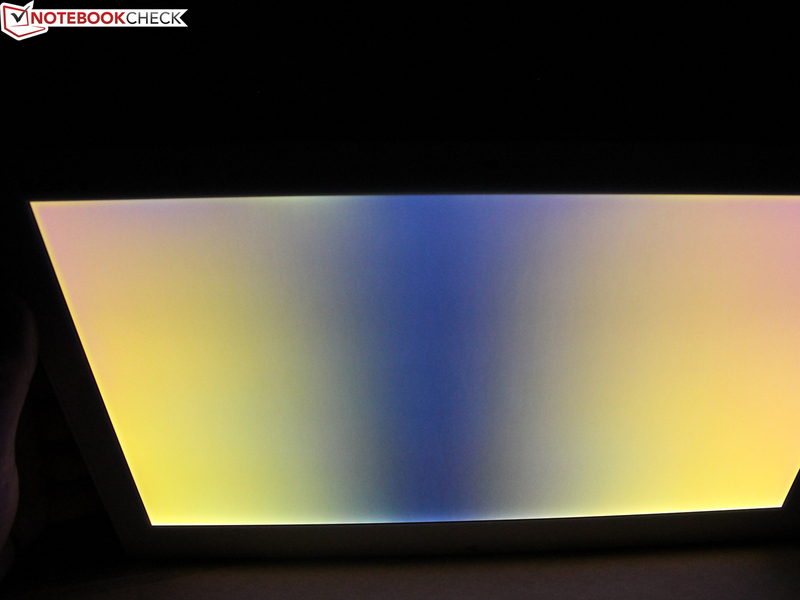 As with most IPS panels, no color inversion occurs. Both the Haswell Core i5-4200U (2 x 1.6 GHz) processor and its integrated HD Graphics 4400 GPU are top-notch and fully up to date. Unfortunately, the 128 GB SSD is a bit on the low side, with just 64 GB remaining accessible to the user. A larger 256 GB SSD increases the price to almost $2000 (SVD1321Z9EB.G4). There is only one alternative choice for the CPU, the Core i7-4500U (2 x 1.8 GHz). How well does the new low voltage Core i5-4200U (1.6 GHz) fare in comparison to its competition? All convertibles and Windows tablets (except for those running on Intel Atom processors) sport low voltage CPUs with a low TDP of 17 (e.g. the i5-3317U Ivy Bridge) or even 13 watts (e.g. 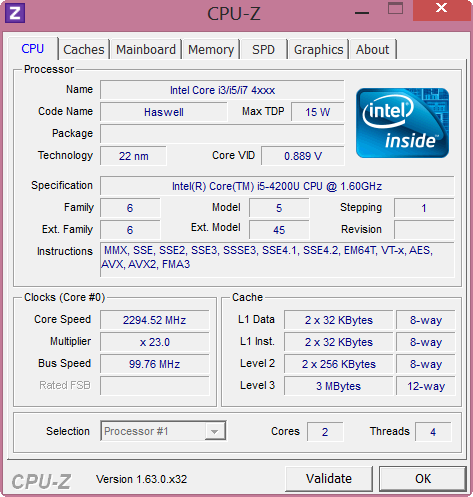 the i3-3229Y Ivy Bridge) with an accordingly low clock speed of up to 2 GHz plus turbo speed in case of the i7-3667U. Our Haswell CPU runs on 15 watts with a clock speed of 1.6 GHz. Not much has changed in terms of Cinebench R11.5 results when comparing the Haswell CPU to its Ivy Bridge brethren (+5% more than the 3317U which is used in the Duo 11). The powerful i7-3517U (1.9 GHz) as used in the Taichi 21 takes the lead, but only by 14%. Due to their lack of a turbo mode, systems based on a Pentium (2117U) or a Core i3 (3229Y) are far behind (-60%). Our figure shows a number of i5 devices (Iconia W700, Samsung Ativ Smart PC Pro XE700T1C, MSI S20-i541) with unusually weak results. All of them are due to an undersized cooling system leading to throttling issues which are detrimental even in simple CPU benchmarks. The competition from AMD doesn't stand a chance in this regard (Duo 13 +59%), but then again we are only looking at the underperforming A6-1450 (4 cores running at 1.0 - 1.4 GHz). The new A8-5M quad-core CPU should yield better results. While running on battery, our Cinebench R11.5 scores (including the OpenGL test, HD 4400 power saving mode deactivated) fell ever so slightly, remaining basically on par with our prior measurements (2.41 instead of 2.47 in the Multi benchmark, 16.19 instead of 17.01 in the OpenGL benchmark). Clock speeds hovered around 2.3 GHz during the Multi and Single benchmarks, with a GPU clock speed of 950 to 1000 MHz during the OpenGL benchmark. 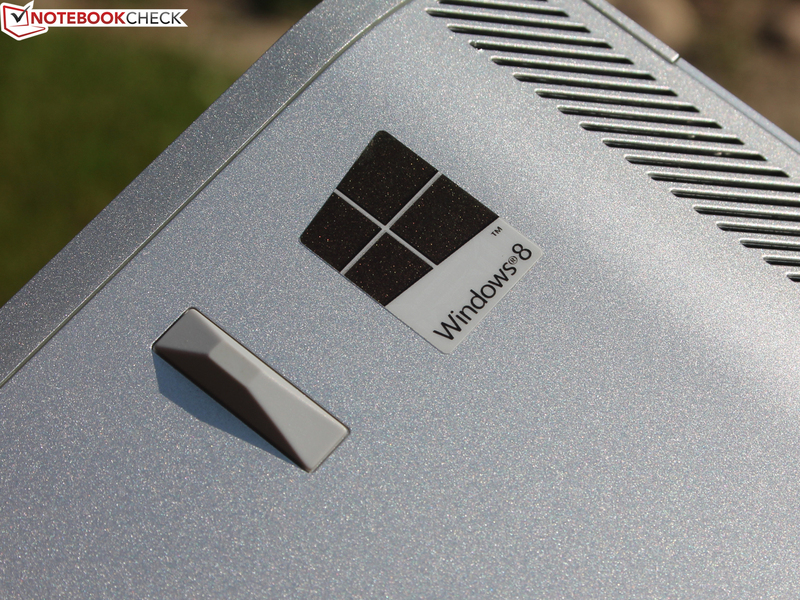 Both the system benchmark PCMark 7 and PCMark Vantage are no unsolvable problem for the Duo 13. 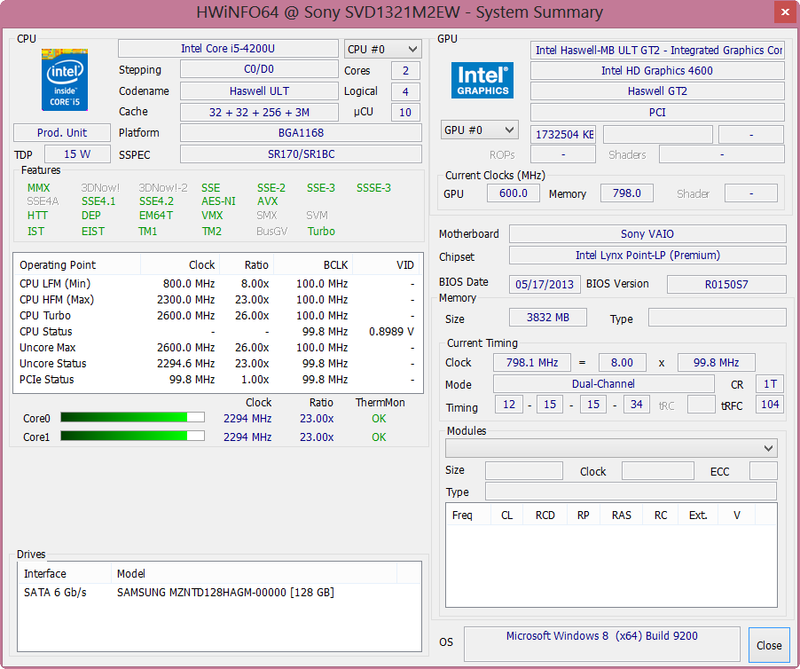 Next to the powerful CPU, this is mostly thanks due to the Samsung SSD PM841 (type MZMTD128HAGN). The Duo 11 came with a Toshiba THNSNS128GMCP (+7%) which was almost on par with the Samsung SSD, but slightly behind the Asus Taichi 21 (Core i7, no throttling issues) with its SanDisk SD5SE2256G1002E (+2%). 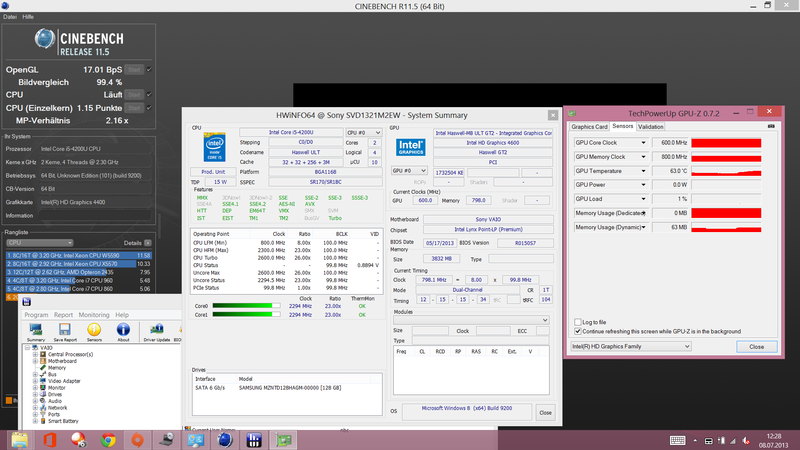 Naturally, HDD-based systems (Acer Aspire V5-122P, Gigabyte U2142-2117U) fare far worse. A lot more interesting is the fact that a pure Windows 8 tablet (with a keyboard dock) such as the Acer Iconia W700 yields almost the same PCMark 7 score (+7% in favor of the Duo 13) despite its throttling issues. 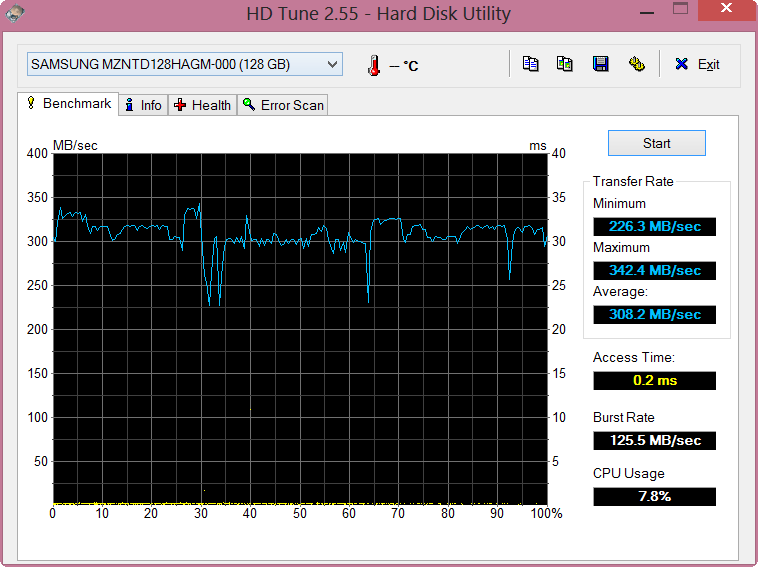 This is mostly due to the SSD (+7%) which compensates for this disadvantage. 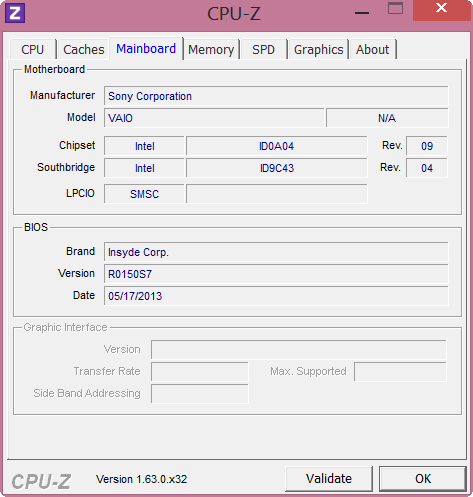 Generally speaking, Ivy Bridge Core i5 systems (such as the Asus Taichi 31) are capable of yielding similar results as the newer Haswell-based system if they are equipped with a fast SSD while not experiencing any throttling issues. Those for whom a strong CPU performance is crucial will be as happy with the Ivy Bridge models as they are likely to become cheaper now. Of course, this only holds true for the competition as the Duo 13 ships with Haswell only. 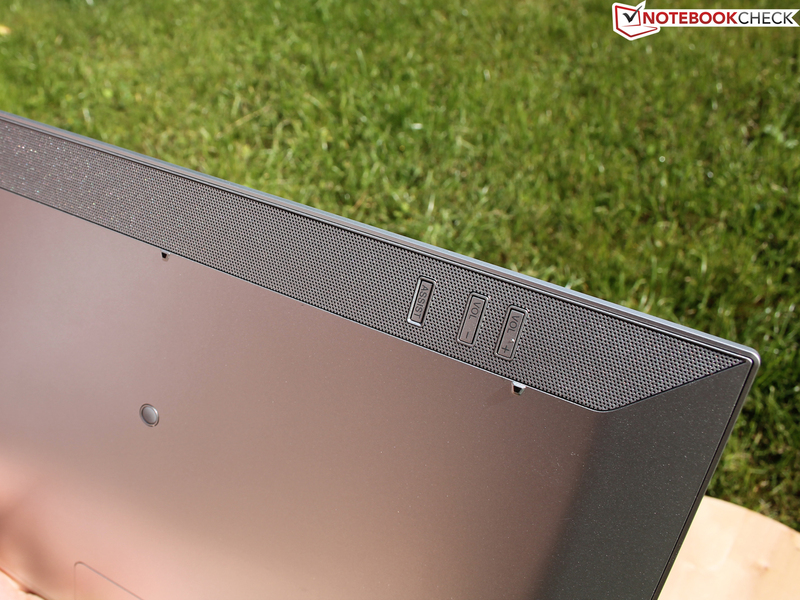 The enormous extra fee of around $200 for the Core i7-4500U version doesn't make too much sense in our opinion. We will have to wait and see how this CPU fares in our throttling analysis, though. 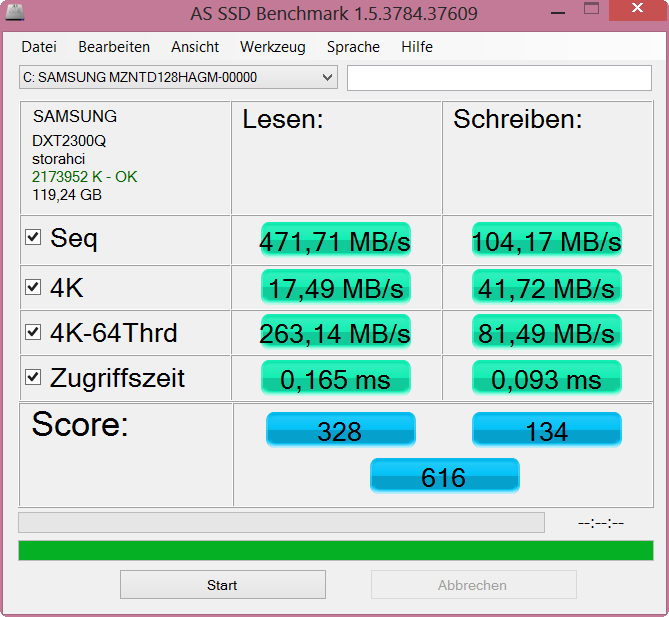 The Samsung SSD PM841 (mSATA module) is one of the best drives in terms of its read 4K performance - and rightfully so. Only the SanDisk SSD of the Asus Taichi 31 offers more than 21 MB/s. Still, a comparison with the premium Samsung SSD 840 Pro (256GB) used in the DevilTech Fire DT14 shows that even more is possible: 38 MB/s (+79%) during the read 4K tests and 534 MB/s (+13%) during the sequential read tests. Once again, low-cost doesn't always have to imply low speeds, as the Acer Aspire P3-171 shows with its Intel SSD 525 (-9% during the read 4K tests). 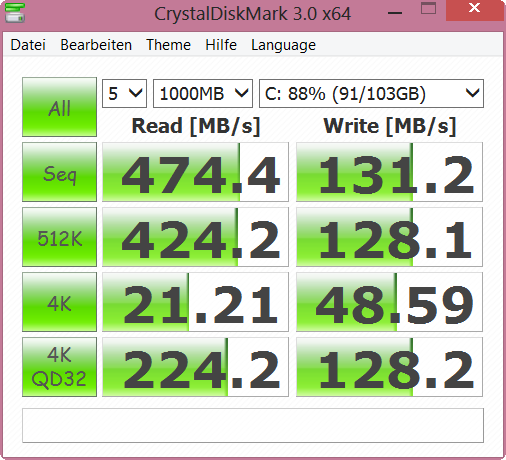 The slim M.2 mSATA SSD used in the Vaio Pro 11 is faster by 45%, most probably due to its 6 GB/s connection. 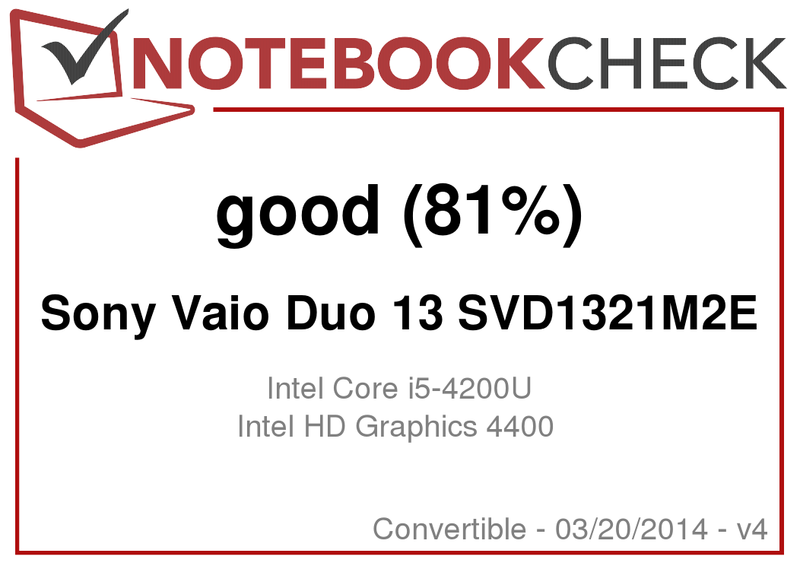 This is the first time we are reviewing a device with the Intel HD Graphics 4400 (simultaneously in the Sony Vaio Pro 11). The HD 4400 clocks at 200 to 1000 MHz, sporting 20 unified shaders, four more than the HD 4000. In the older 3DMark06 benchmark, the HD 4400 takes first place with 20% better performance when compared to the HD 4000 in the Sony Vaio Duo 11 (Core i5, dual channel RAM). 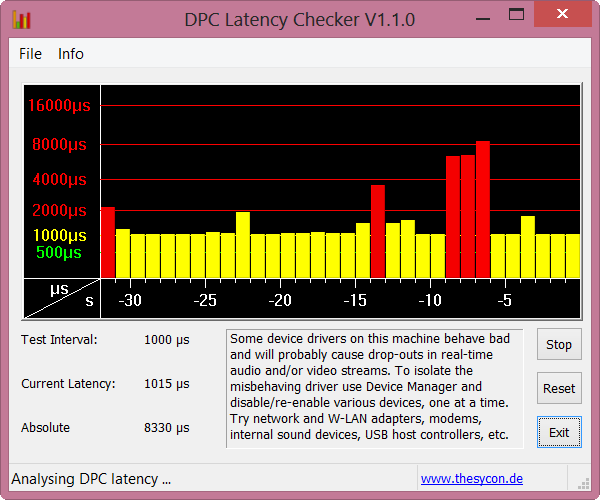 Devices with a slower-clocked HD 4000 and / or single channel RAM fall behind much more (ATIV Smart PC Pro -43%). So what about the less CPU-intensive benchmarks? 3DMark 11 shows a clear advantage for Haswell (+38%, Helix, XPS 12). The Cloud Gate score of the 3DMark (2013) benchmark takes the lead by at least 20% (Taichi 31). Most competitors fall behind by -30% to -50% due to single channel RAM and sometimes CPU throttling (Samsung Ativ Smart PC Pro). A pure shader benchmark with little influence of the drivers is the Cinebench R11.5 OpenGL test. 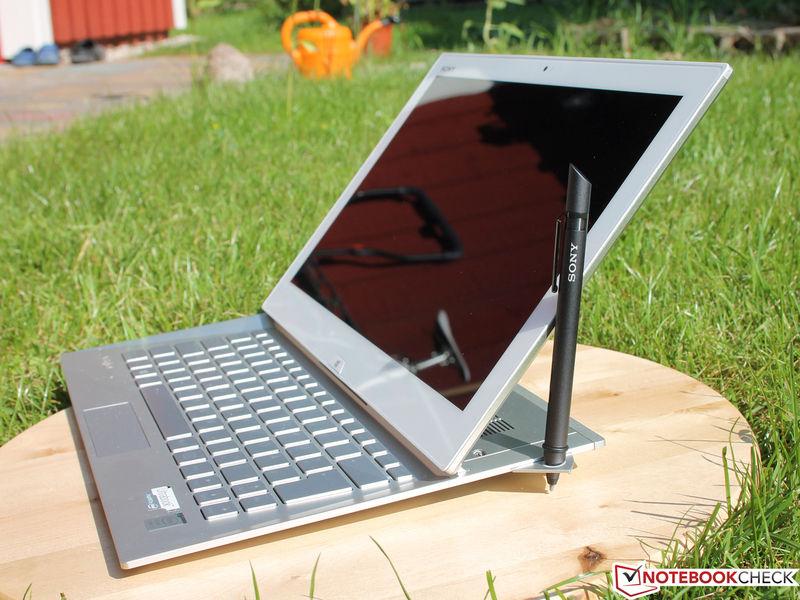 Here, the Sony Vaio Duo 11 (i5-3317U) falls behind by 7%. 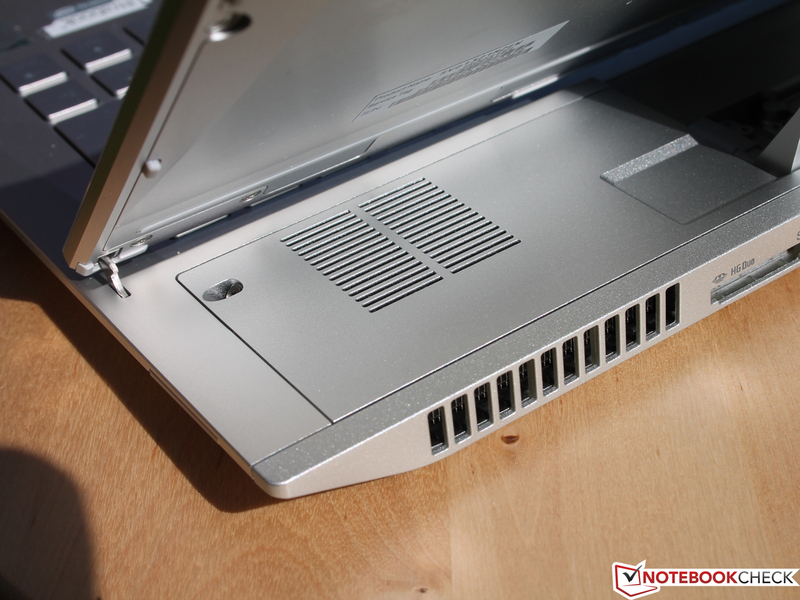 In the case of the Asus Taichi 21 (i7-3517U), the difference is -5%. 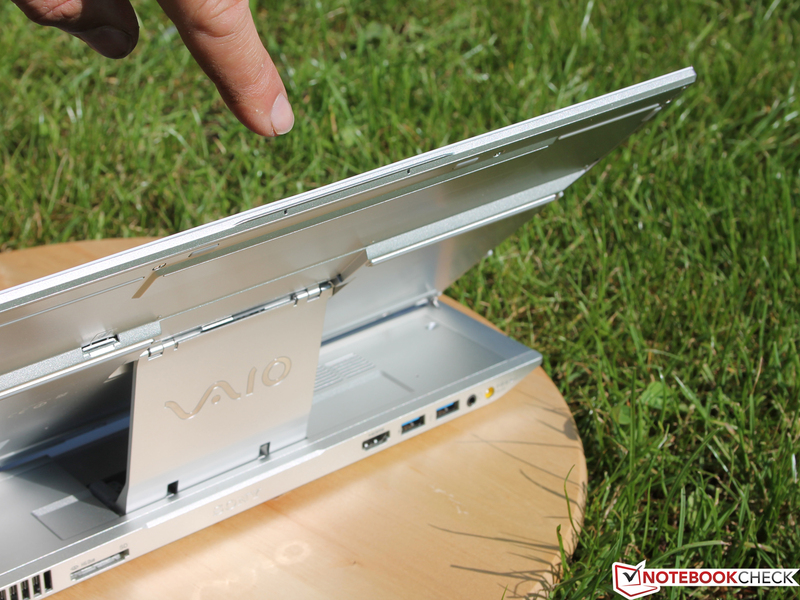 How well do older and more recent games run on the Vaio Duo 13? Surprisingly, many games offer solid frame rates of more than 30 fps even on medium details although part of this is due to the dual channel RAM. 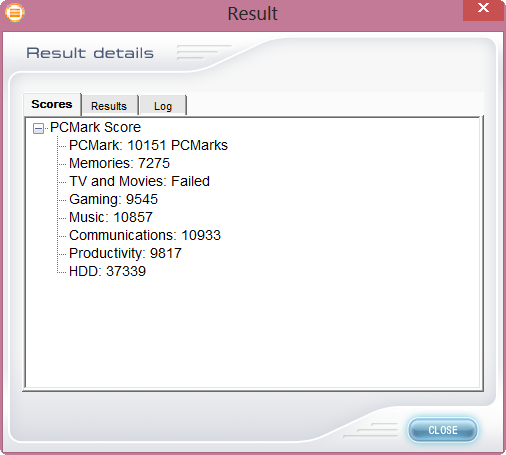 The advantage of the HD 4400 is especially evident in Anno 2070 (Taichi 31 -37%) and Diablo III (Dell XPS 12 -32%). In the case of FIFA 13, this difference actually grows to 50%. So is Haswell a viable alternative for gamers? 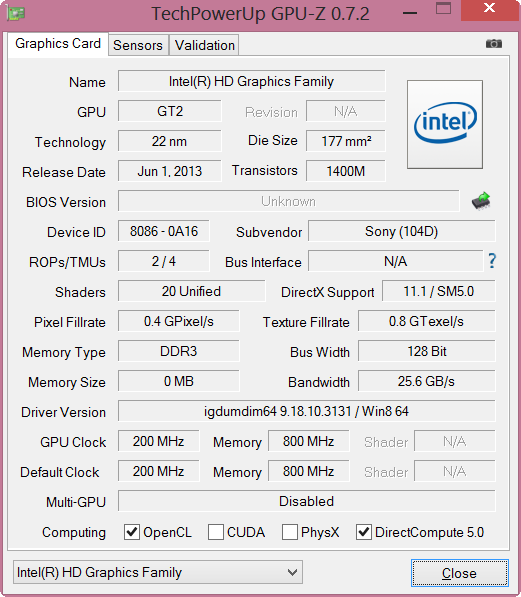 Below, you can find a comparison to a current entry-level graphics card, the GT 720M (as used in the Asus F75VC). On average, this dedicated GPU runs around 61% faster, but even that is not fast enough to consider switching to high details or high resolutions. More detailed thoughts about the gaming prowess of Haswell's new integrated GPU can be found in our review article Intel HD Graphics 4600 "more than meets the eye" (testing a somewhat more powerful variant). 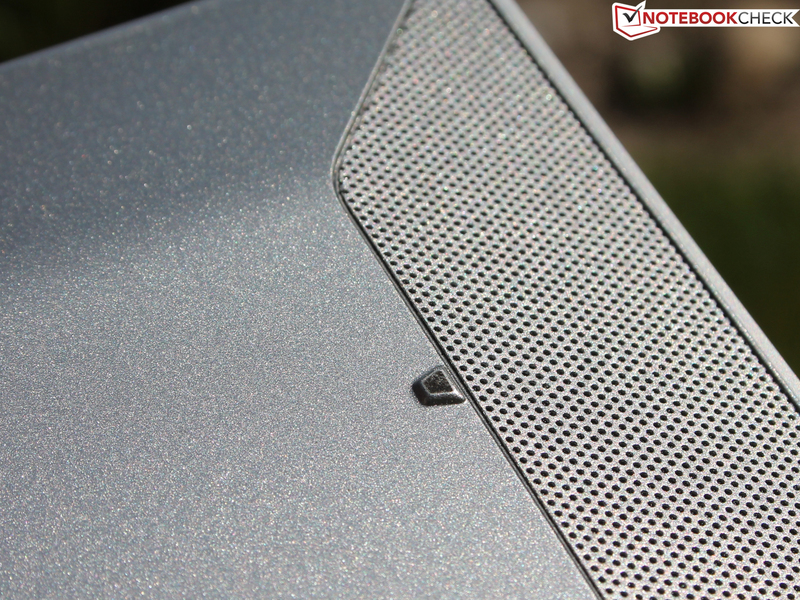 The single fan on the rear end of the 13-inch device is absolutely necessary in order to cool the powerful hardware inside. Luckily, it does a pretty good job remaining pretty quiet. When the laptop is idle, the fan deactivates itself after some time. When it does come on, it is barely audible. During our stress test, we are trying to find out whether the cooling system is strong enough to handle extended periods of maximum loads without any throttling or cooling issues. The latter is not the case, but the fan does get a tiny bit louder. 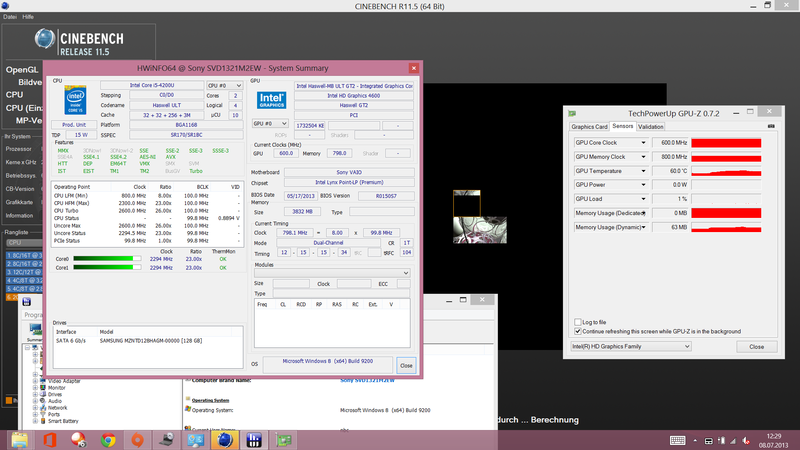 Still, no more than 33 dB(A) is reached, no matter whether our stress test, 3DMark06 or Cinebench Multi is running. This is far below our threshold of around 40 dB(A), the fan thus never gets annoying - an impressive feat given the slim profile and strong performance of the Duo 13. The Duo 13 never gets exceedingly hot. 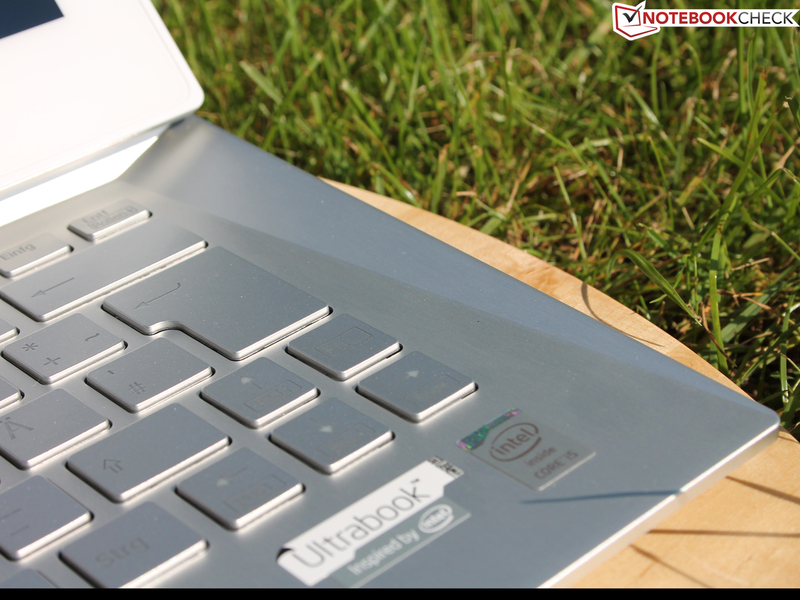 Thanks to its design, the keyboard and the area beneath remain cool at all times. Only the section of the base unit which lies beneath the display heats up due to the chips and the cooling system being located there. 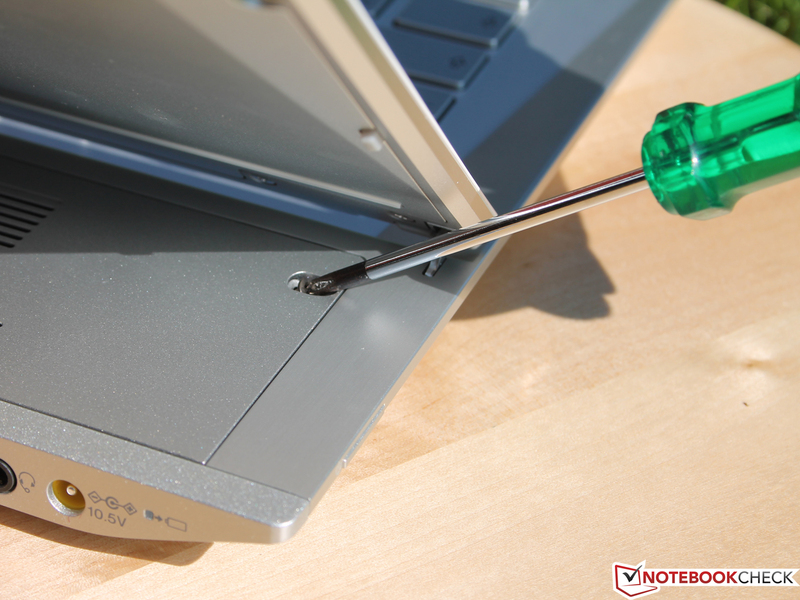 The average value beneath the laptop comes to lie around 31 °C, with a localized peak of 45.6 °C. 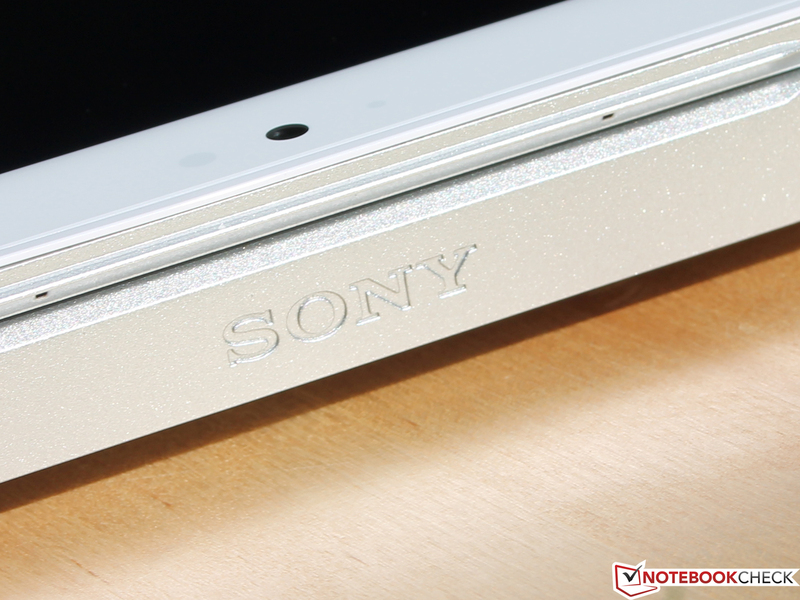 Still, this part of the convertible will probably only be touched while carrying the device. During our stress test, the Duo 13 remains at 1.6 GHz for several hours. Thus, no throttling occurs, but the turbo boost gets deactivated after some time. However, the HD 4400 stays in turbo mode even for prolonged periods of time, being clocked at 900 to 950 MHz, well within the upper end of its range of 200 to 1100 MHz. The temperature of both units reach a plateau at around 68 °C (CPU and GPU are located within the same chip). Thus, no actual throttling occurs. 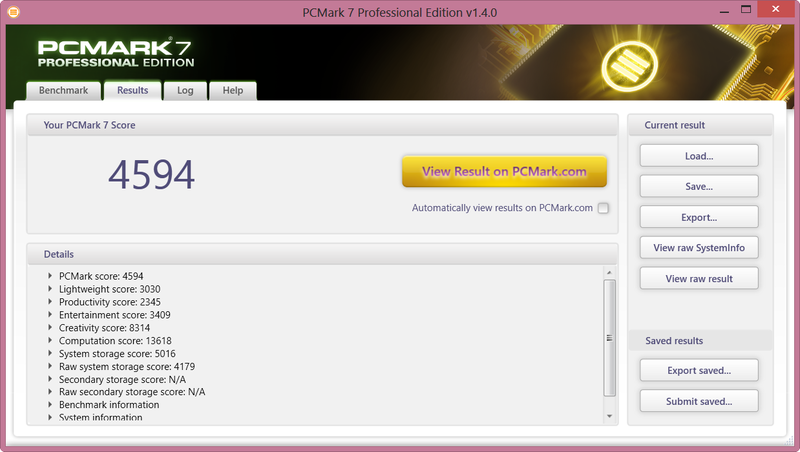 The results of the above-mentioned pure CPU benchmarks are quite good. 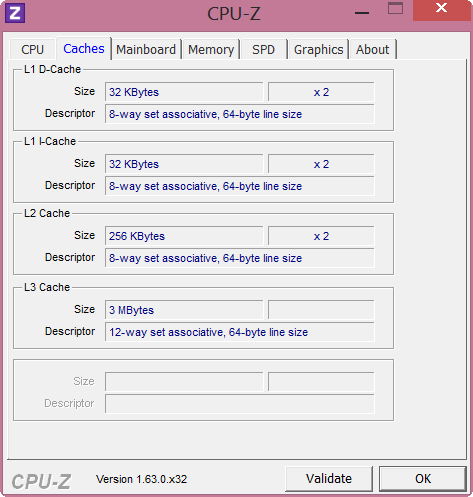 Here, the CPU is capable of using most of its turbo speed, being clocked at 2.3 GHz. Most users will be able to make use of the turbo feature under normal loads (e.g. image processing, copying files, etc.). The turbo mode will rarely be deactivated completely as only power users will tax the system accordingly. 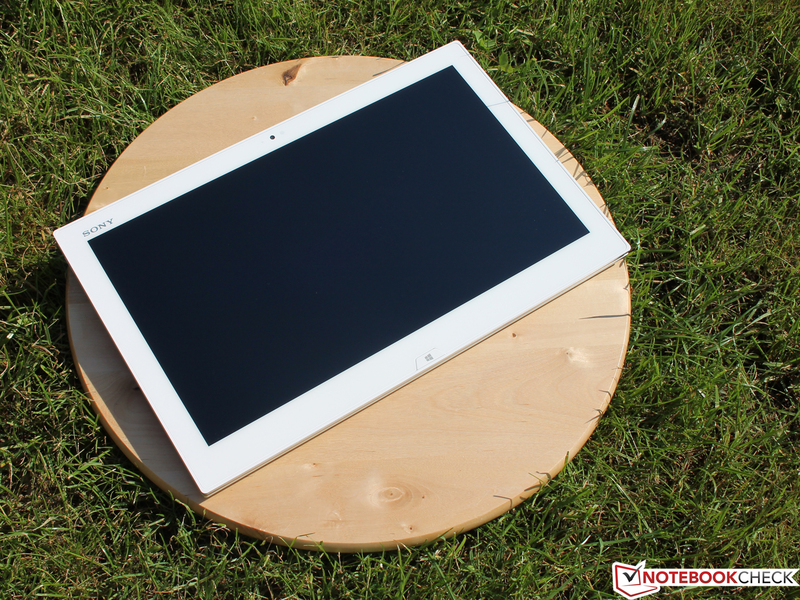 (+) The average temperature for the upper side under maximal load is 28.3 °C / 83 F, compared to the average of 30.3 °C / 87 F for the devices in the class Convertible. (+) In idle usage, the average temperature for the upper side is 26.2 °C / 79 F, compared to the device average of 30.3 °C / 87 F.
The speakers are located at the front, below the palm rest. They get rather loud considering that this is a 13-inch device and keep the same audio quality when used in tablet mode (as they aren't covered by the display). Still, this is nothing to write home about. Mids are fine, but bass is virtually non-existent. At least no clanking or scratching sounds develop when the volume is turned up. 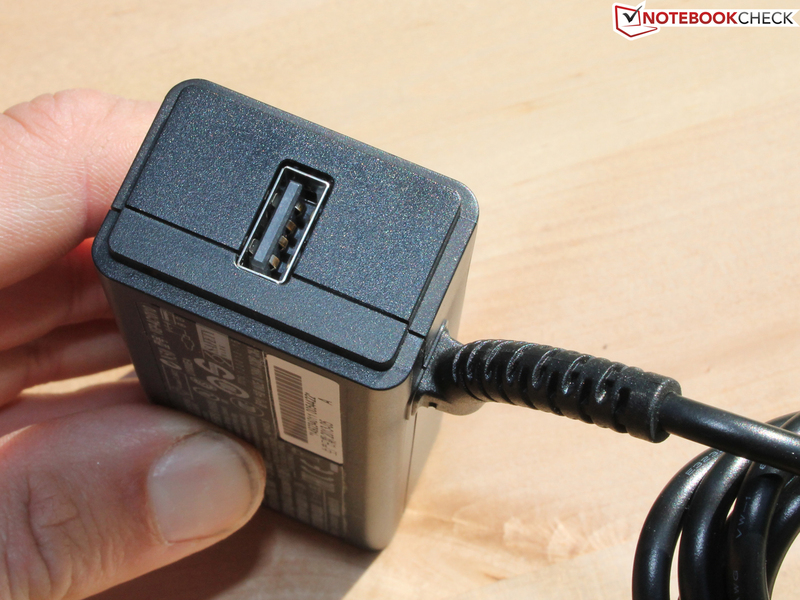 The power adapter (40 watts) takes 2:51 hours to charge a fully discharged battery. The low power consumption levels while idle are most likely due to the improved energy efficiency of the Haswell chip. It may have helped that an integrated chip has been used as none of the competitors manage to make do with 3.3 to 6.6 watts. Even more astonishing: The 6.6 watts has been measured at its peak brightness of almost 400 cd/m². The power adapter is well-dimensioned. Even during our more absurd stress tests, no more than 31 watts is required (see above, CPU turbo not active), considerable less than the 40 watts the power adapter provides. When compared to its Ivy Bridge siblings, the systems requires approximately 5 watts less, both under full load and while idle (here, the clock speed of just 200 MHz of the HD 4400 helps a lot). The competition can barely compete with the Duo 13 in this regard. While idle (lowest brightness, airplane mode, balanced energy mode), the 13-inch convertible manages to stay alive for an astonishing 23:49 hours. Under full load, as measured with the Battery Eater Classic Test (instead of our stress test), 2:20 hours is possible, while battery life as measured during the more realistic Wi-Fi test came out as 6:59 hours. Both the Duo 11 (7:20 hours while idle, 3:47 hours during the Wi-Fi test) and the Taichi 31 (5:44 hours / 4:13 hours) fare worse in this regard, and even the ThinkPad Helix (9:19 hours / 7:18 hours) and the Iconia W700 (11:09 hours / 6:33 hours) barely manage to remain on par with the Duo 13. When looking at the ratio between weight and runtime, the Duo 13 with its 1.33 kg and its 47 Wh battery is the lone victor. Despite its small battery (which is good for its overall weight), it is the longest-running when compared to its competitors: Taichi 31 (1.55 kg, 53 Wh), ThinkPad Helix (1.67 kg, 70 Wh) and the Iconia W700 (0.95 kg, 55 Wh, tablet). None of them manage to beat the Duo 13 in terms of battery life. 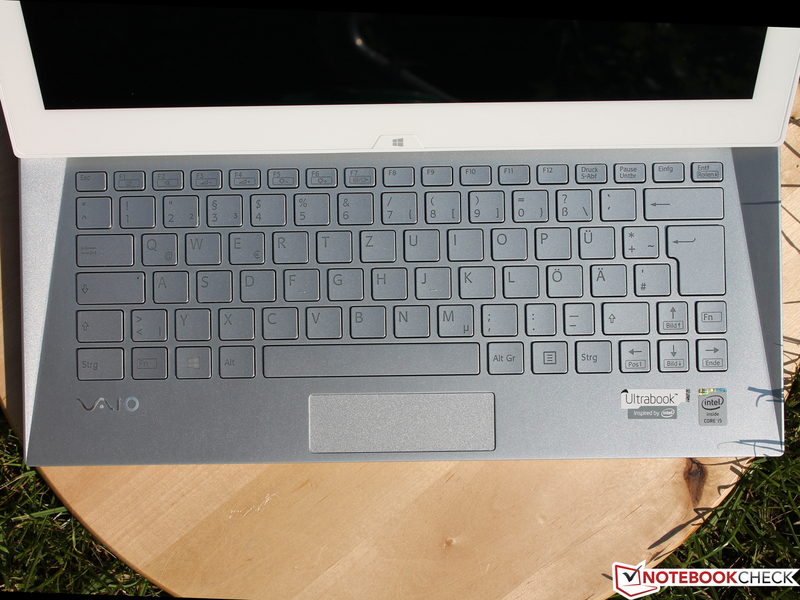 We are, however, looking forward to our review of the Haswell-based 13.3-inch Samsung ATIV Q convertible. 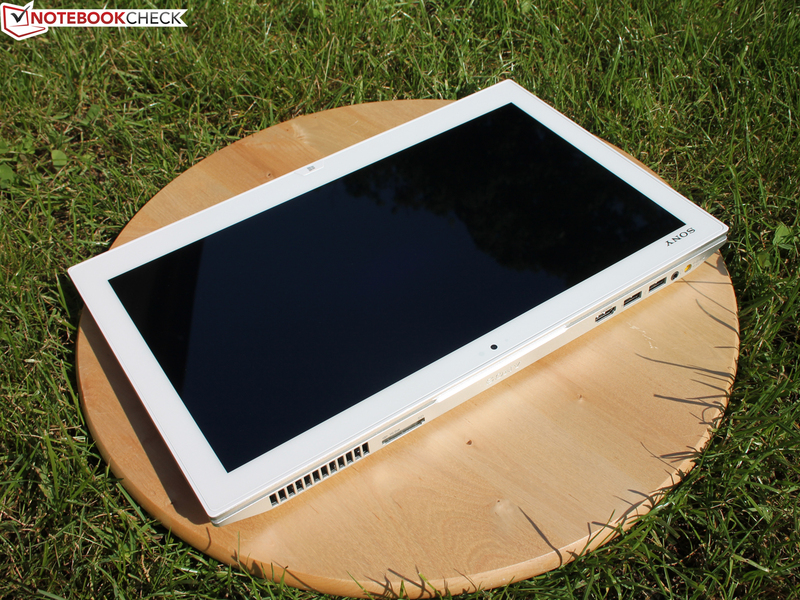 Sony has chosen the right direction constructing a 13-inch sibling to the 11-inch Duo 11. 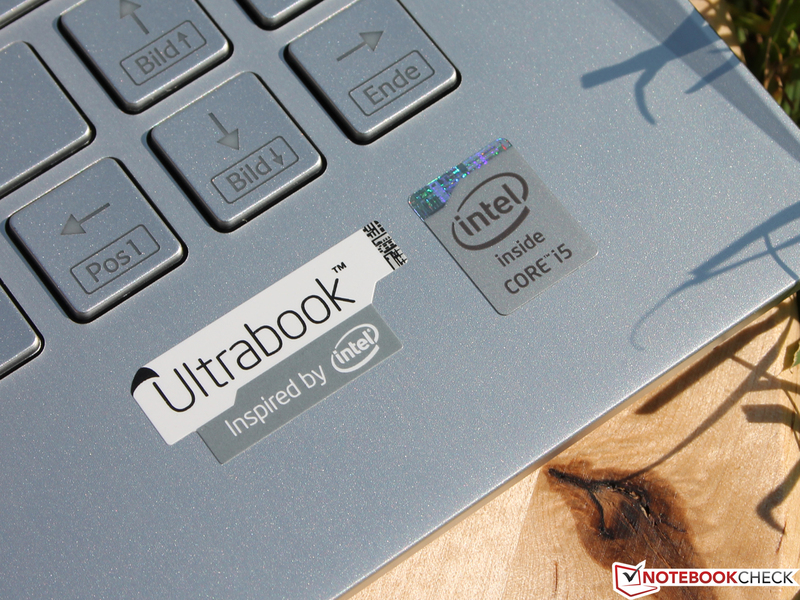 The ultrabook hardware is top-notch: A fast SSD, an economical yet fast Haswell generation CPU with an integrated GPU even better suited for casual gaming. The high-resolution Full HD IPS panel offers great brightness levels, vibrant colors and superb viewing angles (although falling short of covering all of sRGB space). 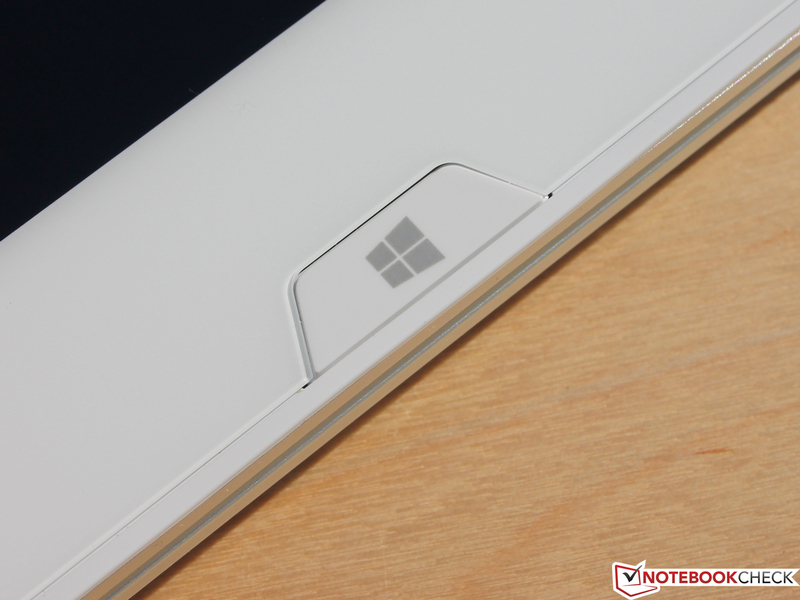 Build quality is good, too, with a sturdy, (hopefully) reliable hinge. Still, users of a $1400-machine (or more, depending on the variant) may want to take some care when opening and closing the device. 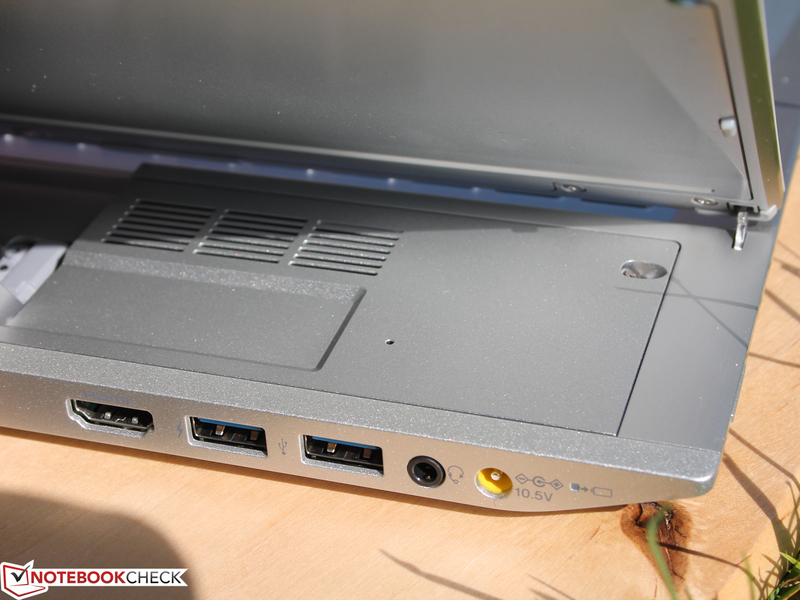 Next to an HDMI port, there are just two USB ports which are located too close to each other. The Duo 13 ships with a 3G modem (a 4G/LTE variant is available as well) and an excellent 8 megapixel webcam. 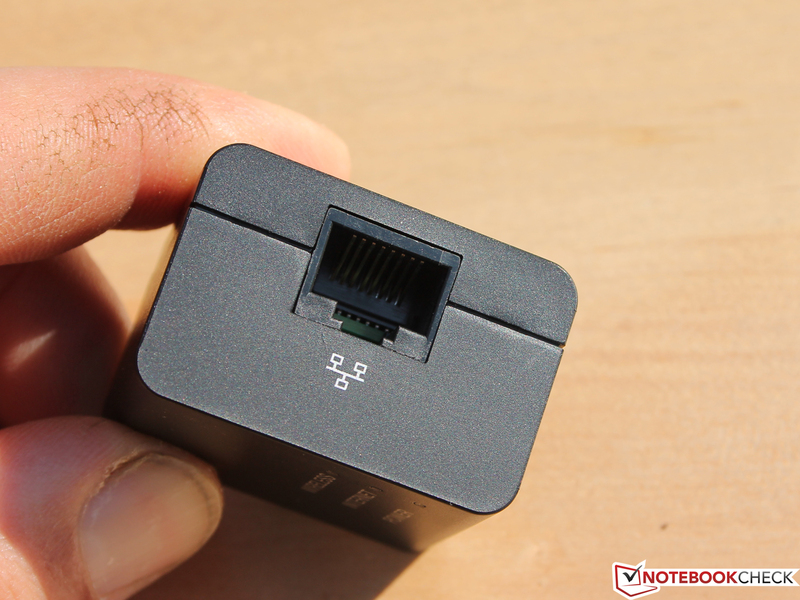 VGA and Ethernet can only be used via a converter dongle and a wireless router respectively. Battery life is top-notch. 24 hours while idle is a new record for ultrabooks. Even the 7 hours we got out of the battery during our standardized Wi-Fi test is a great result considering that we are talking about a 13-inch device which only weighs 1.33 kilograms. Unfortunately, outdoor usage is a bit problematic due to the reflective glare type panel. A similar approach is taken by Samsung's ATIV Q Convertible, a 13-inch device with impressive specs, running two operating systems (Windows and Android) and sporting a QHD panel (3200x1800 pixels). 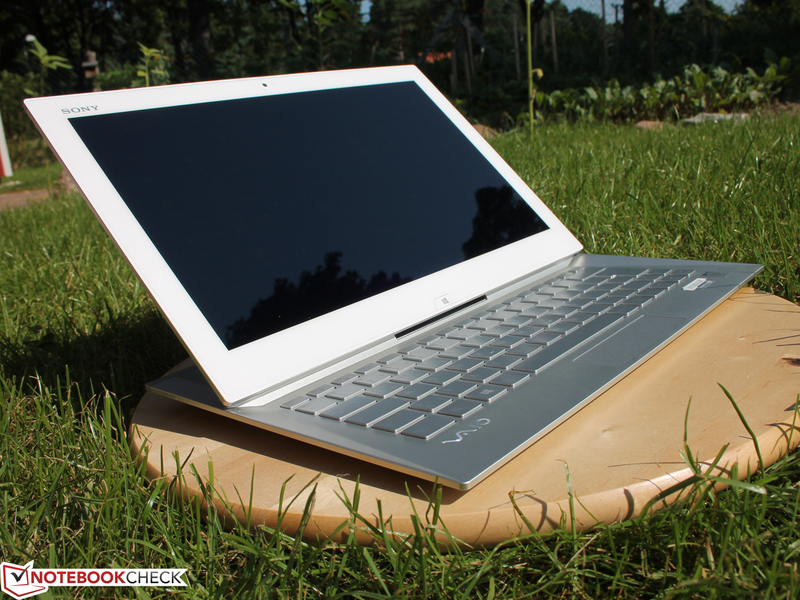 Samsung's keyboard is superior though thanks to a firmer pressure point and more travel. 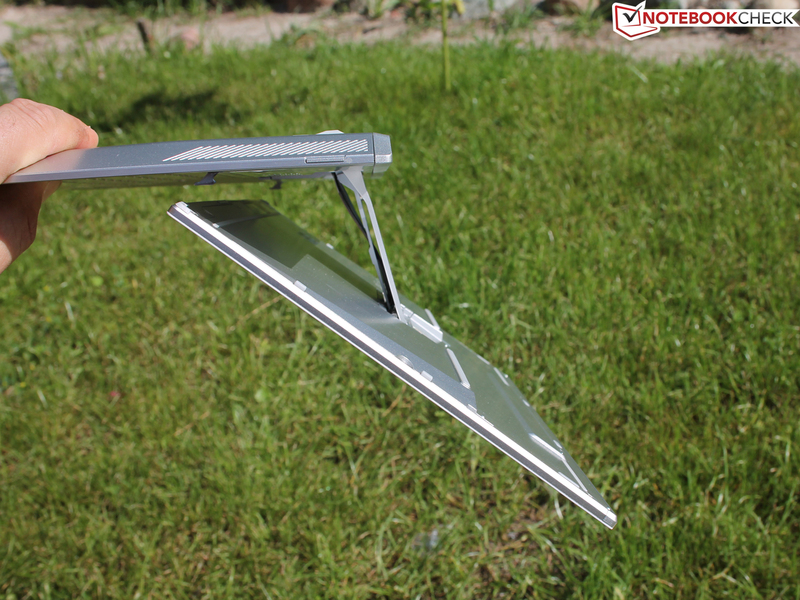 In addition, there is always the possibility of tilting the display by 90 degrees backwards (in order to use it for movie watching or presentations) or of using it in the horizontal "table" mode. Those who might rather decide in favor of an actual tablet while retaining the possibility of using a keyboard might want to have a look at the Acer Iconia W700, a powerful workhorse with strong battery life and a great Full HD panel where the Bluetooth keyboard is fitted into the case with which the tablet ships. 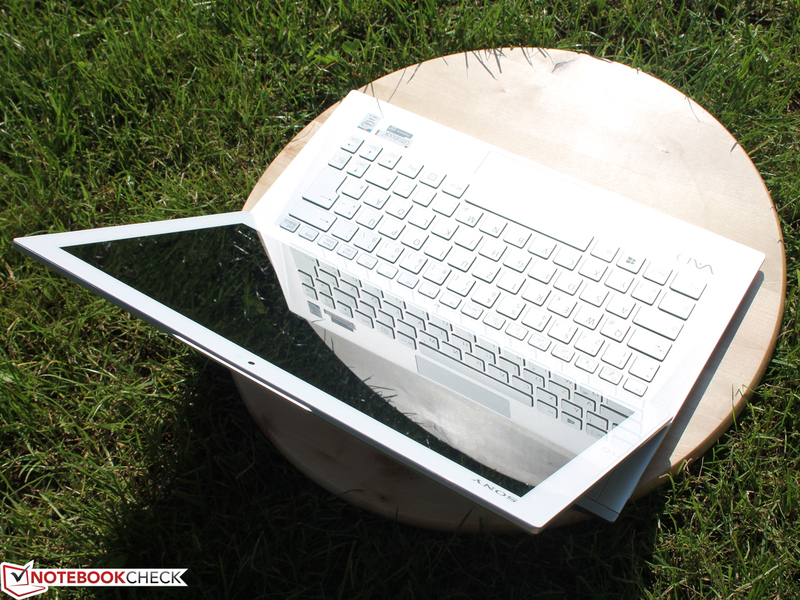 Sony Vaio Duo 13: With such a bright display, working in the sun is a lot more fun. 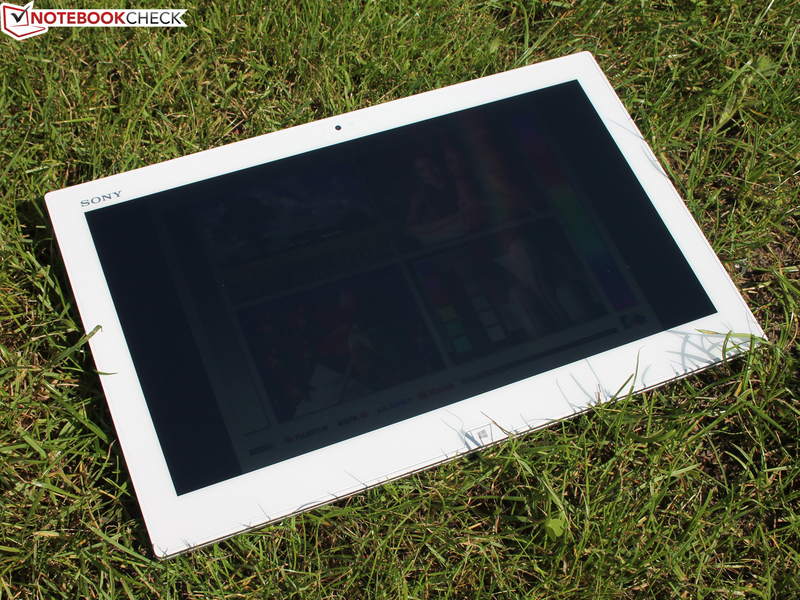 ...Sony builds a similar 13-inch Windows 8 tablet. The slider mechanism is retained, but reduced in size. ...and the tablet moves almost magically into position. Little metal hooks lock the lid in place. ...but it certainly feels like it keeps the 13.3-inch display rather firmly in place. Those parts in need of cooling are located behind the display. Users don't have to be afraid of the keyboard area becoming too warm. All ports are located at the rear. 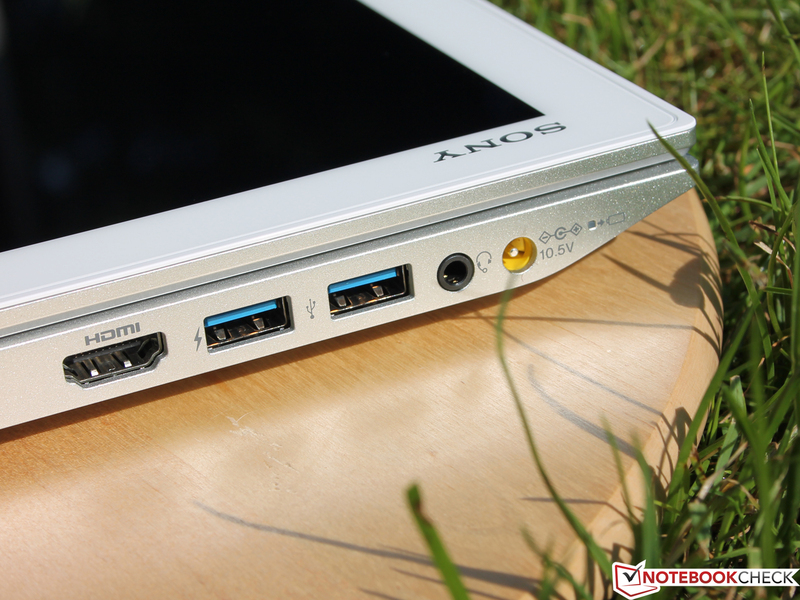 Of course, no Sony device would be complete without a Sony Memory Stick HG-Duo slot. The notch for one of the metal hooks. 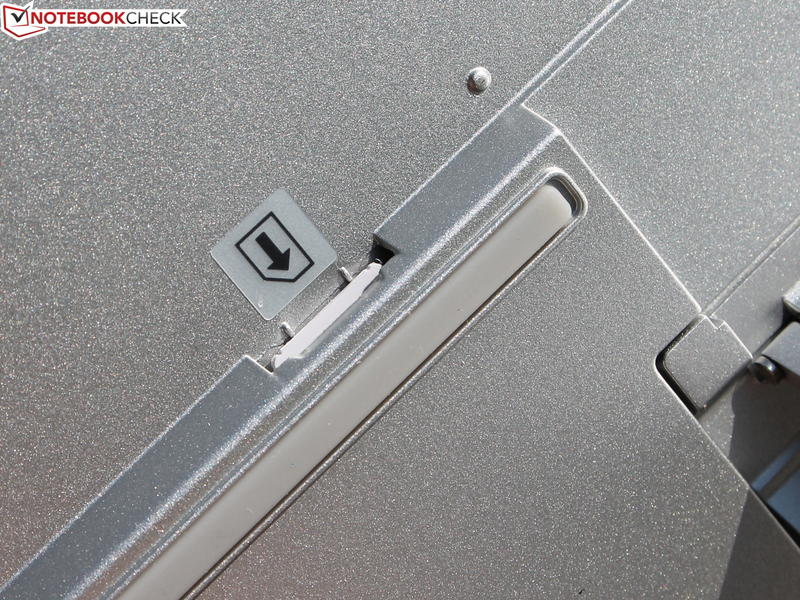 The SIM card slot is found on the rear of the display. Its comfortable, amply-sized keyboard. Unfortunately, the weak key travel takes some getting used to. Accessibility? Not so fast! This leads nowhere. 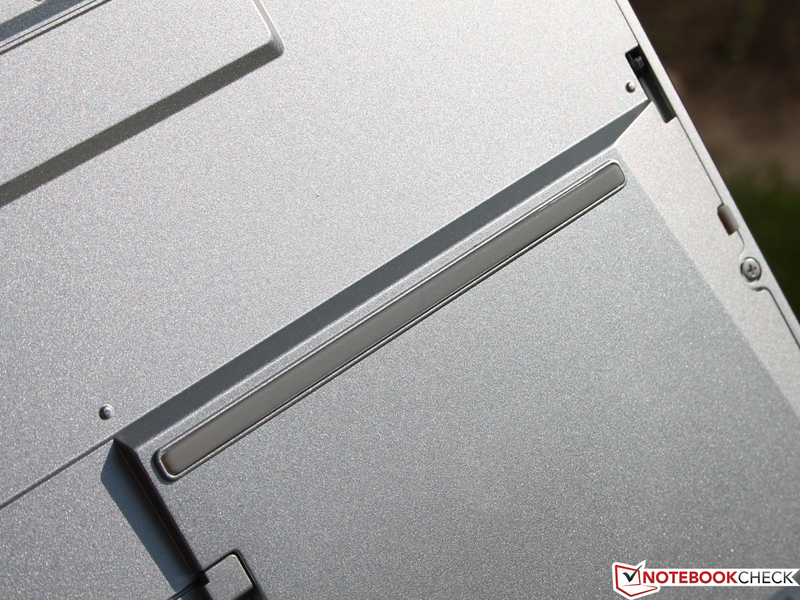 Once in notebook mode, the rear panel of the base unit wobbles a bit. No "table mode" as with some of the competitors. 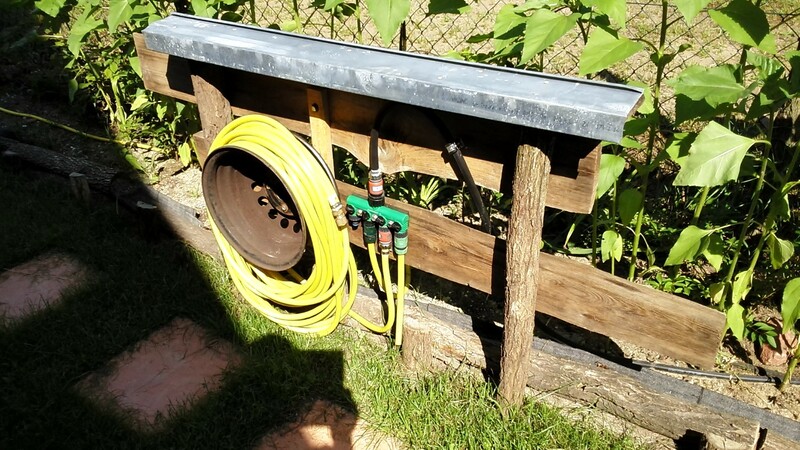 The panel can thus not be placed horizontally above the base unit. 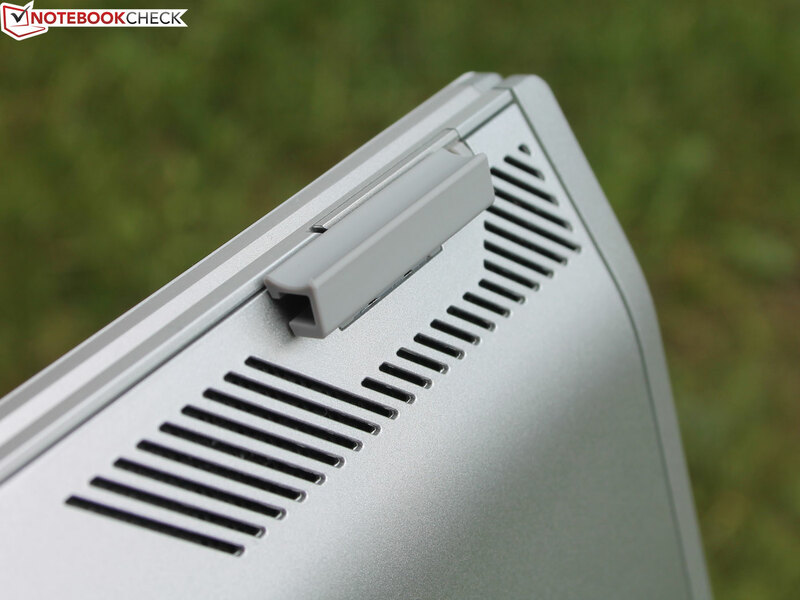 How well does the hinge keep the display in position? This way, it's not a problem. Same here. At least as long as we don't shake the device. Now, the hooks detach from the notches, but the display remains in position. ...being replaced by a small clickpad. 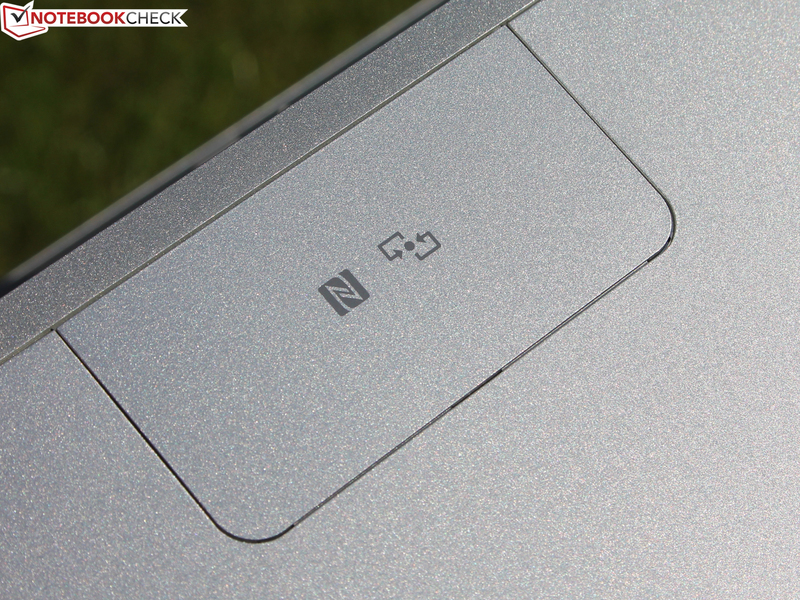 The button is hidden beneath the clickpad area. Depending on the position of the user's finger, right and left mouse clicks are recognized, too. ...as its glare type panel comes with strong reflections. Even the high maximum brightness isn't enough to counteract this effect. 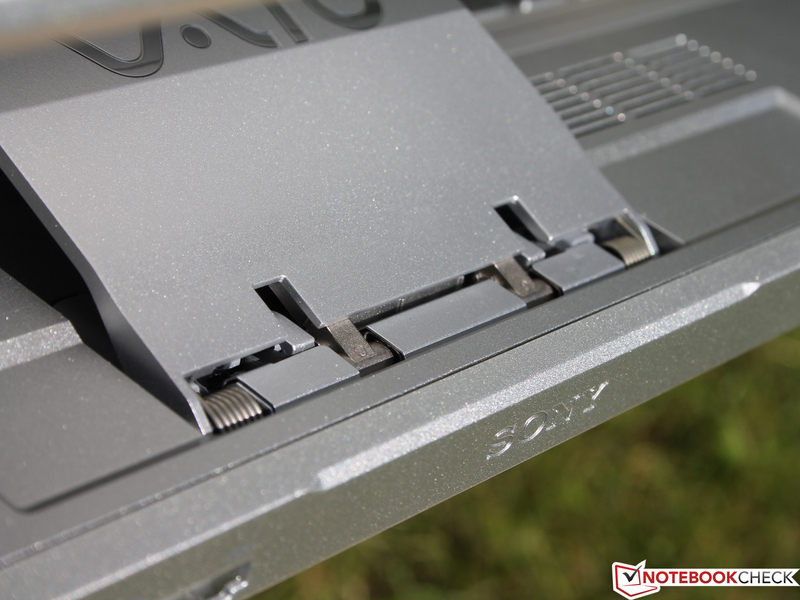 Sony actually offers an optional anti-glare protective foil for the Duo 13. We are quite happy about the general concept of the device. 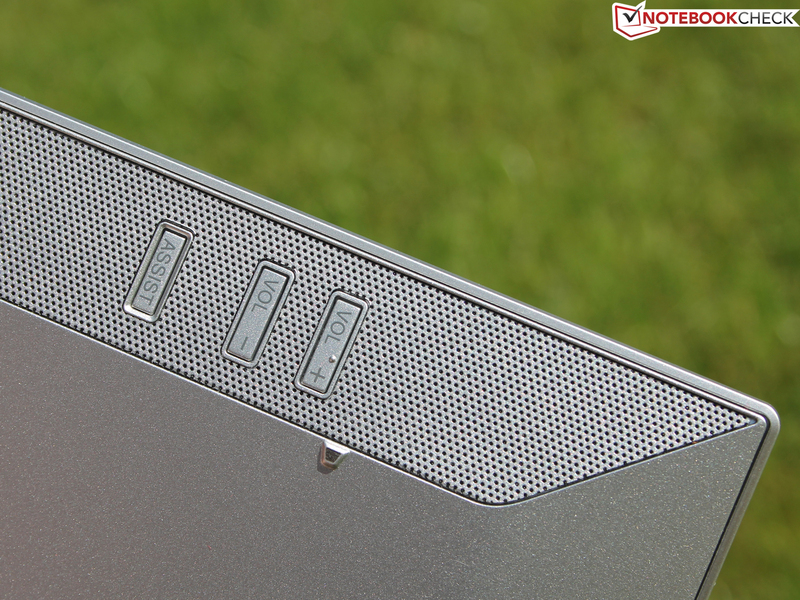 ...while still offering enough power to reach laptop-like performance levels. ...allow for the same kind of productivity as with every other subnotebook. ...works well with this elaborate, unconventional laptop design. ...add to the positive overall impression. 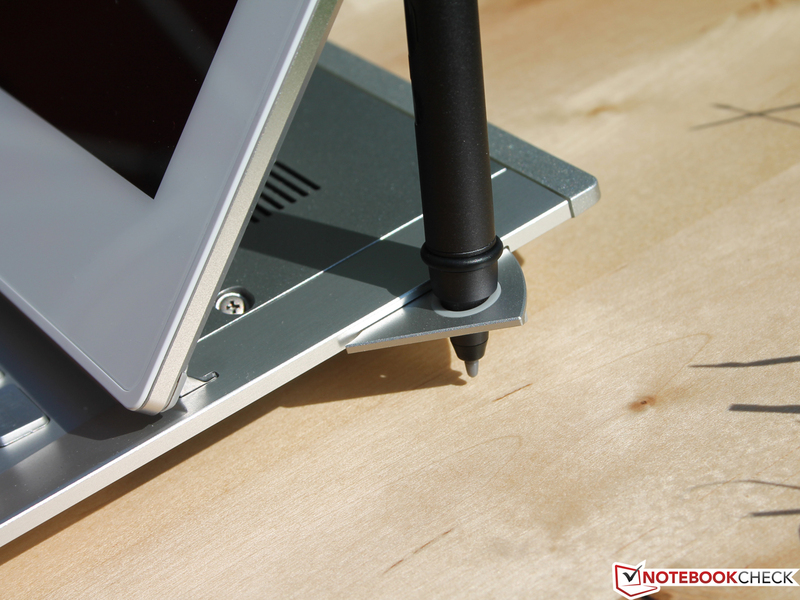 Next to the keyboard and the touchscreen, input via stylus remains a third possibility. The Duo 13 ships with an active pen (comes with a battery) which enables handwritten notes and drawings. 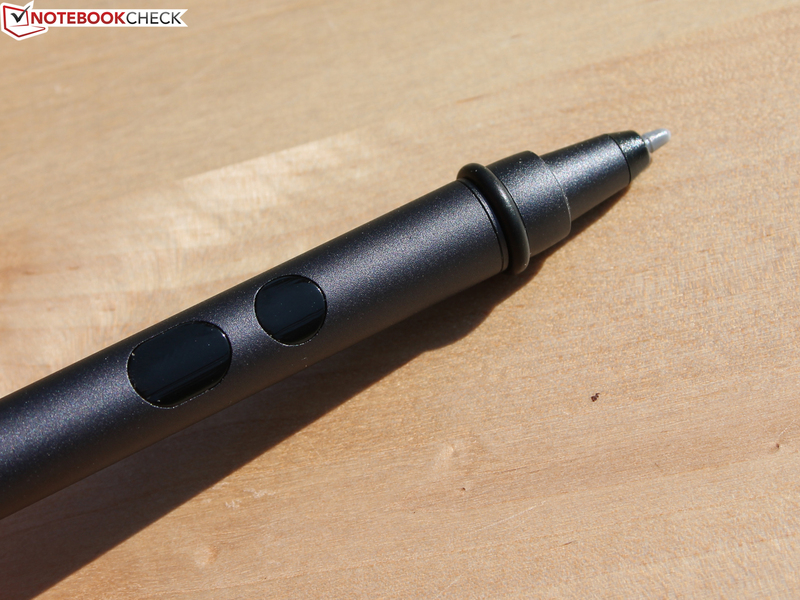 Due to the high screen resolution, precise input might actually be easiest using the stylus. An interesting idea: The wireless router which comes with the device. 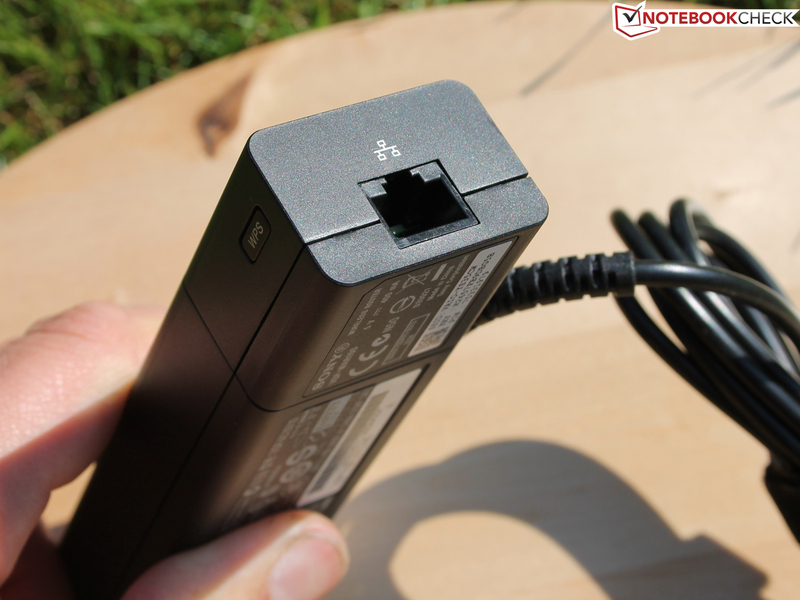 It is connected to the power adapter, being supplied with power by the latter. The router with an Ethernet port allows creating a network. 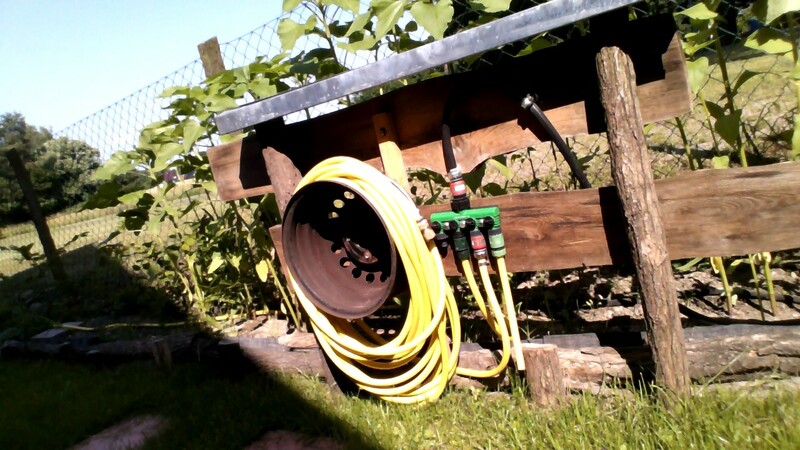 This works well up to a distance of approximately 15 meters (with one wall in between). ...ad hoc connections without inputting an SSID or a password by a press of a button. Not enough space: Why do the two USB ports have to be located so close to each other? 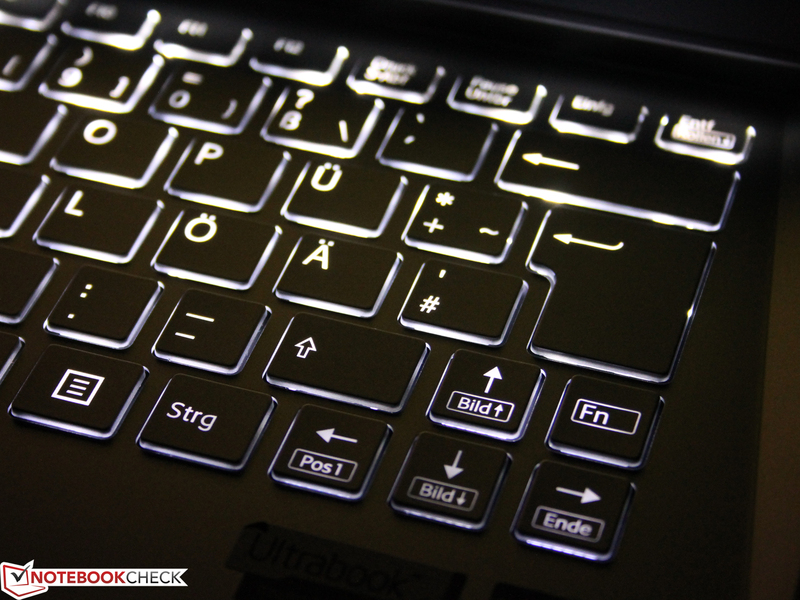 Great in a dark environment: The keyboard is backlit (one step). ...the two background LEDs when it is dark. Next to the borders, this even becomes evident during actual usage. 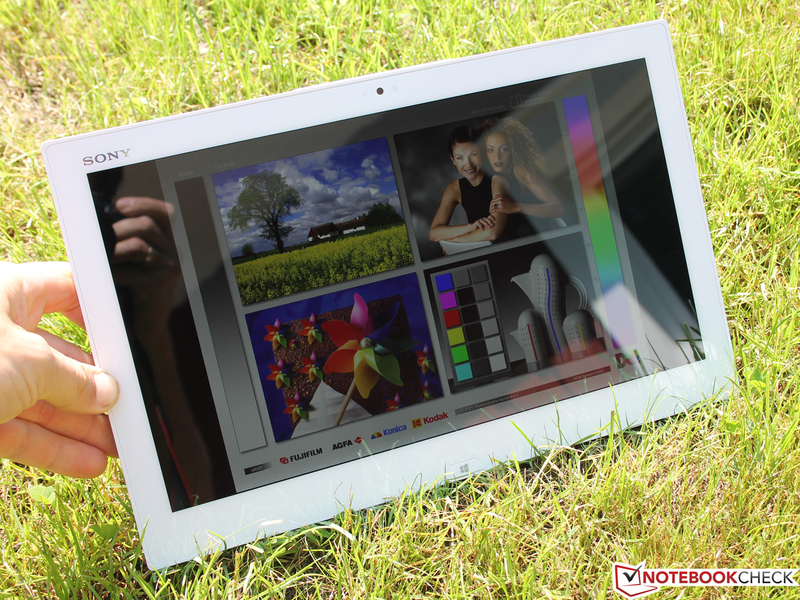 Sony Vaio Duo 13 SVD1321M2E: Great contrast ratio, bright display, vivid colors. 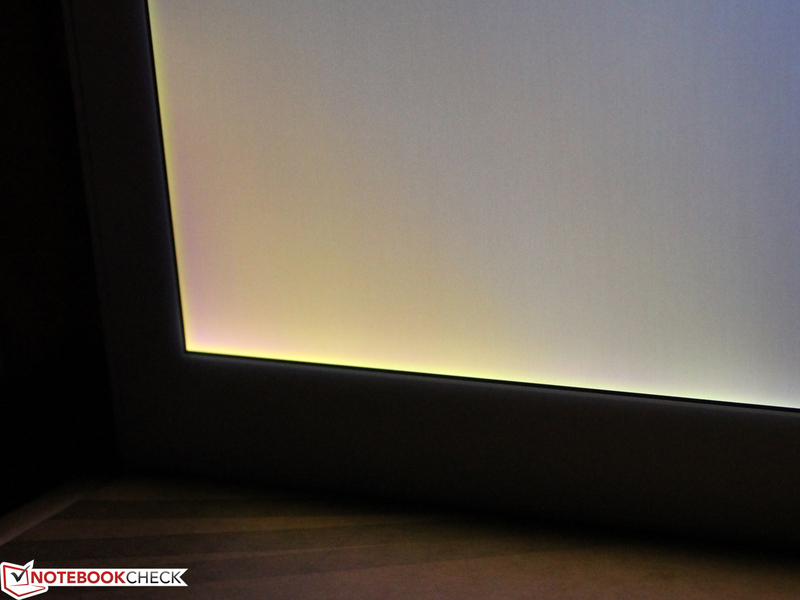 Sony's Triluminos panel makes a good impression. The Duo 13 is a great jack of all trades for all those looking for a fast Windows convertible suited for productivity tasks. 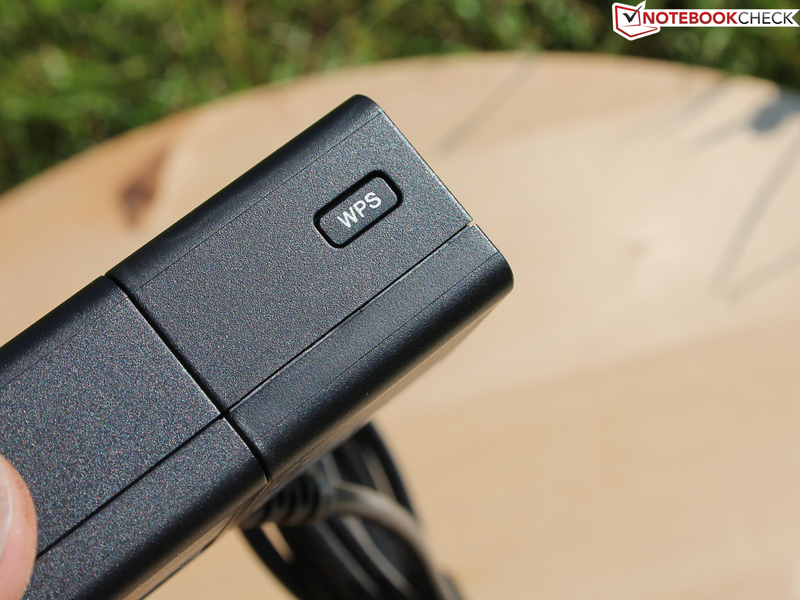 The small selection of ports is alleviated by a number of accessories ranging from a VGA dongle to a wireless router with an RJ45 connector. Swapping the battery? Cleaning the fans? Upgrading the RAM or putting in a larger SSD? Impossible except for experienced tinkerers. The keyboard is no optional accessory, but essential to the operation of the device. More travel would have made a noticeable difference. Placing these few ports so close to each other could and should have been avoided. Asus Taichi 31; Sony Vaio Duo 11 SV-D11; Acer Aspire P3-171; Lenovo ThinkPad Helix; Dell XPS 12; Acer Iconia W700.